During the 1800’s, what is now the United States of America was being explored and colonized by various European powers for it’s land and resources. 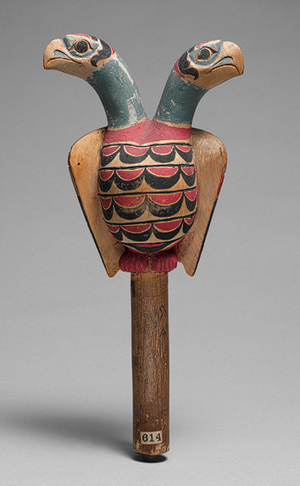 Among these nations was Russia, which played an important role in exploring America’s northwest frontiers. In the course of over 140 years, the nation sent over 225 ships into the North Pacific to create and trade with it’s colonies. 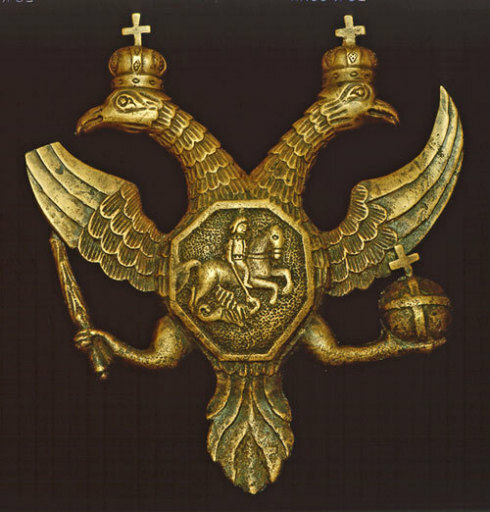 Although it’s presence in America was not as large as that of the British or Spanish, the Russian American Company was the Russian monarchy’s foremost example in it’s claim to the new world. Read on to know more about what was once the Russian American Company and it’s many colonies across western America. 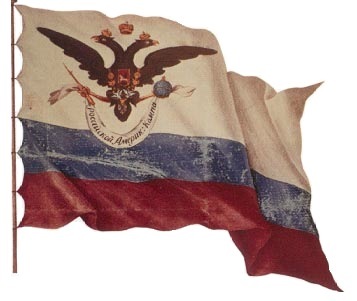 Seeing the large amount of potential resources to claim, the Russian government, under the rule of Paul I, had decided to send an expedition to America. 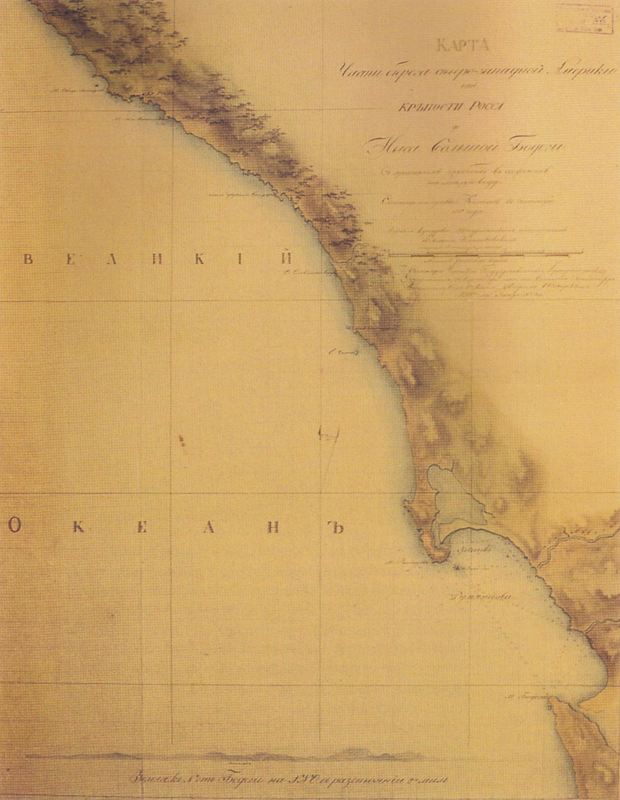 This is when the Russian American Company was founded in Irkutsk (although the company would later move it’s main building to St. Petersburg in order to allow further cooperation with monarchy) on July 8, 1799 to explore America’s pacific coast and it’s outlying islands and regulate fur trade within those areas. But the origins of the company began much earlier in 1725 when Peter the Great, sensing his imminent death at 53, began an endeavor to explore the North Pacific and make contact with the peoples. 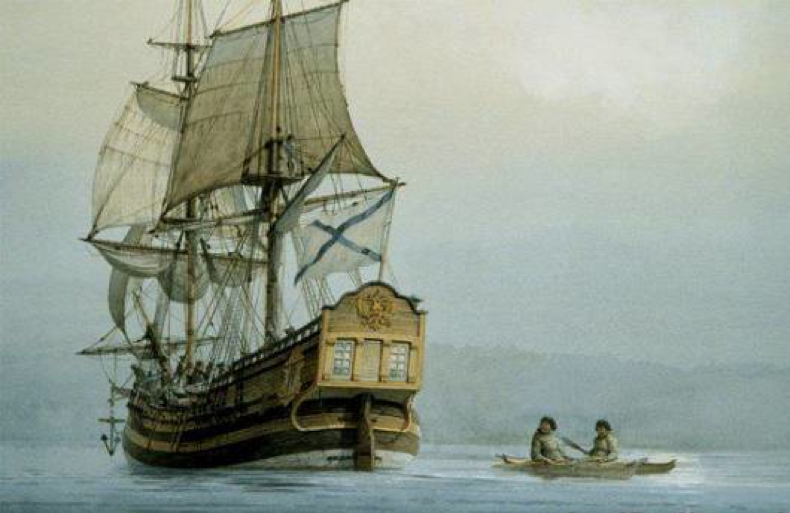 On July 15, 1741, Aleksei Chirikov, during an expedition launched by the government, spotted the Alaskan coast, making him and the crew of the St. Paul the first Europeans to make landfall on Alaska. Roughly a day later, a second ship, the St. Peter, commanded by Vitus Bering, sighted Mt. Saint Elias. 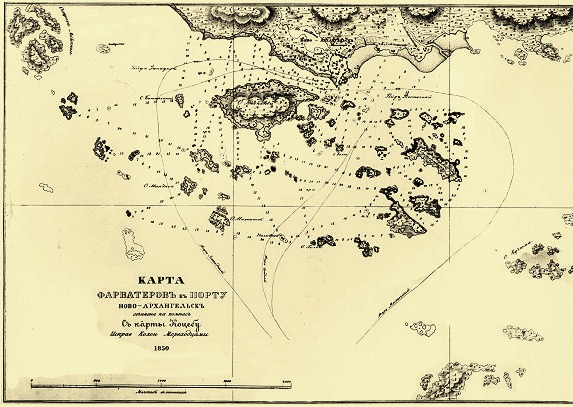 Soon after the discoveries, both ships set a course back to Kamchatka to tell the government of their findings. On the way, the St. Peter made stops at several islands along the way (including the Shumagin islands, which they named for a crew member who died on board), they yet again met several natives who invited the crew to the island. After trading several goods, the ten Russians sent to trade with the natives began to return to the ship, but the natives had held one back. Wrestling free, he swam to the safety of the boat while the crew began to fire muskets into the air to ward off the Aleuts. The next day, before departing, the crew of the St. Peter traded once with the natives. Through this ordeal, the Russians had made first contact with the native people of Alaska, an omen of what is to be. Soon after, the St. Peter had come to face disaster. Much of the crew began to have illnesses (mostly scurvy) and there were not enough healthy men to man the sails. On the 4th of November the crew landed on Bering Island (named in the captain’s honor), thinking it was Russia. The ship ran aground in shallow water and was later lost in a storm. Soon after, Bering, along with several other crew members, died of scurvy leaving the survivors of the wreck without a captain. Stranded for almost an entire year, the crew used the remnants of the ship to create a boat of which to sail back to Russia. In 1742, the crew returned and brought with them several sea otter pelts, proof of an awaiting opportunity and the dangers that follow. Through the perilous journey, it is said only forty-five of the original crew of seventy-six survived. Because of the potential for resources and economic growth, wealthy Russian merchants began to hire Siberian traders to go to the Aleutian islands and collect pelts, which would late be sold to the Chinese, turning a large profit. In the coming years, more companies began to send hunters to the new world and each time in greater number. 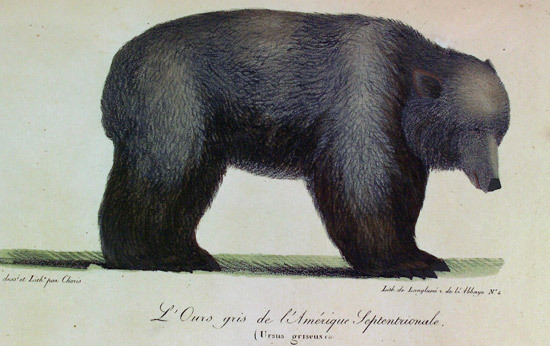 It is said throughout the 1740’s and 1799, over forty companies and merchants sent expeditions to Alaska and the surrounding islands, exporting an average 62,000 pelts a year (worth roughly 350,000 rubles) per company. Since then, the first major explorations began when Grigory Shelikhov, a Rylsk-born seafarer and merchant organized trips by merchant ships to Kuril and Aleutian Islands. 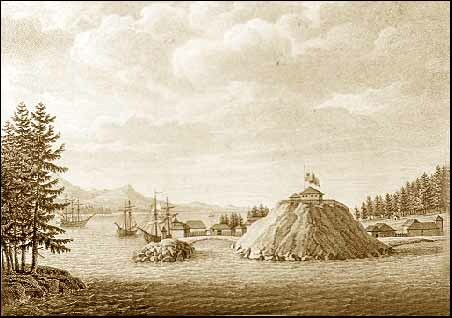 Soon after, expeditions to Alaska took place in 1783 to 1786 were organized with Ivan Larionovich Golikov under the Shelikhov-Golikov Fur Company, which would organize the earliest permanent Russian settlements on Alaska. The results of these expeditions were the predecessor to the Russian American Company. 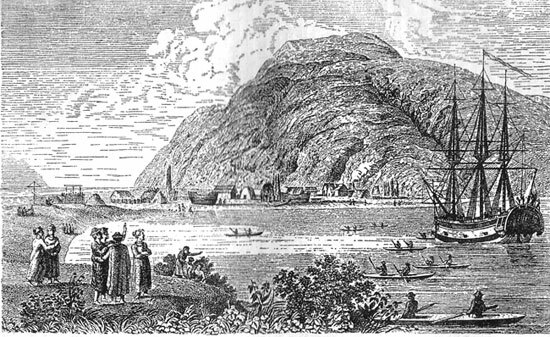 The expedition’s first landing began in 1784 when Grigory Ivanovich Shelikhov arrived on Three Saints Bay of Kodiak Island on two ships, the Three Saints and the St. Simon. 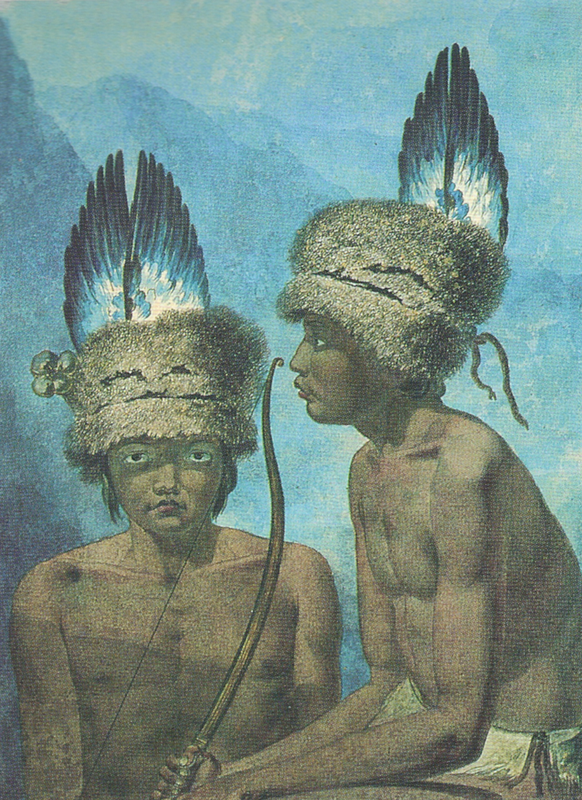 The indigenous Koniaga were the first to make contact with the Russian settlers, although they would later become a nuisance to Shelikhov, convincing him to kill several hundred of the natives to set an example for the rest and to achieve dominancy over the land (he would later attempt to reconcile with the native by offering gifts and establishing trade deals). Following this, the first permanent Russian settlement would later be built on the land. 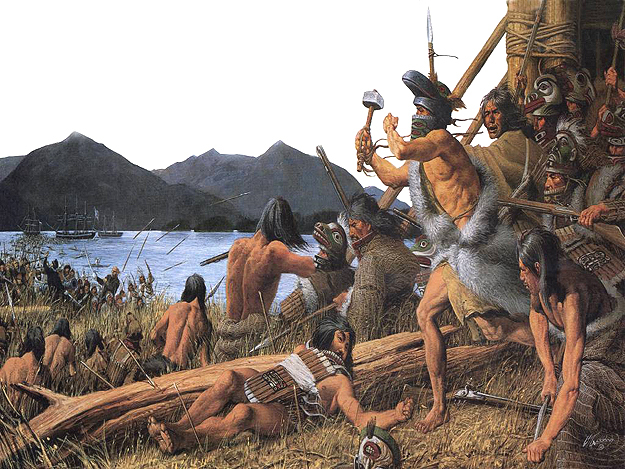 From the settlement, hunters were sent into Cook Inlet and Prince William Sound in order to trade with the locals, although these visits did not always end in a friendly manner. At the time, Shelikhov’s company was not the only one in Alaska. 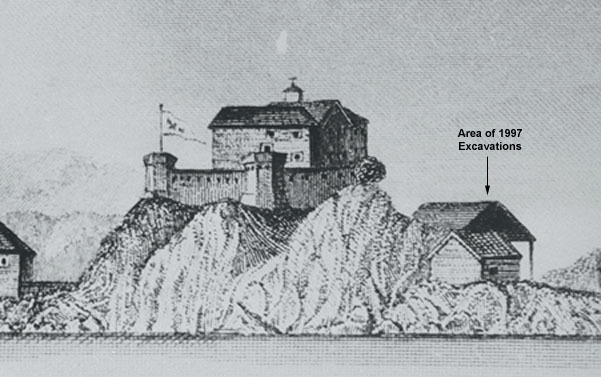 Pavel Lebedev-Lastochkin had also claimed parts of Cook Inlet (mostly near the mouths of several rivers) by building several outposts, creating competition for Shelikhov. Although after time, the outposts were absorbed into The SGC. 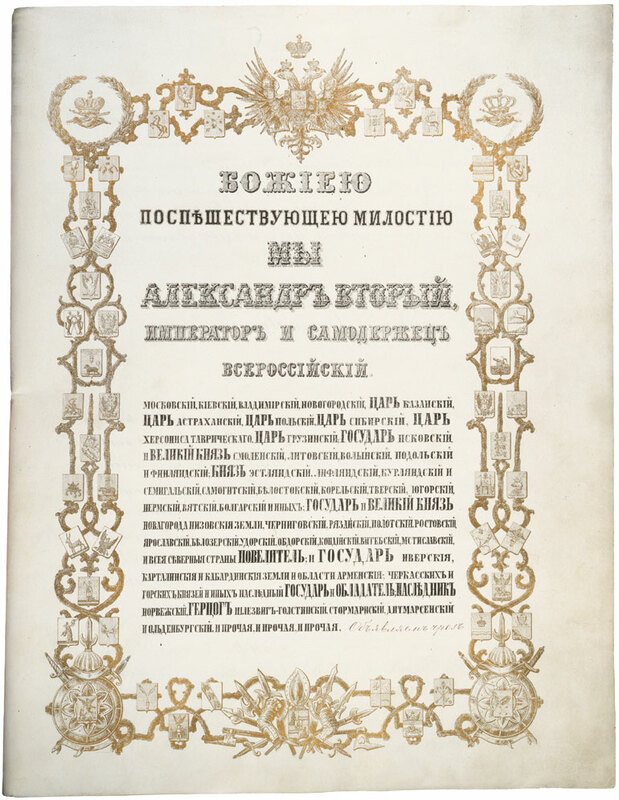 With that done, Shelikhov’s son-in-law, Nikolai Petrovich Rezanov, acquired a monopoly on the Russian fur trade with the approval of Tsar Paul I on July 8, 1799 under a 20-year contract and an initial donation of 724,000 rubles from the royal family’s personal assets. So began the Russian American Company. Following the monopoly, Rezanov promised the Tsar new expansions in the Russian fur trade which included expansion further down America and the creation of new settlements in Alaska. One of the company’s ventures took place in modern day Alaska from 1799 to 1861, this was generally known as Russian America until 1867 when it was sold to the United States government. 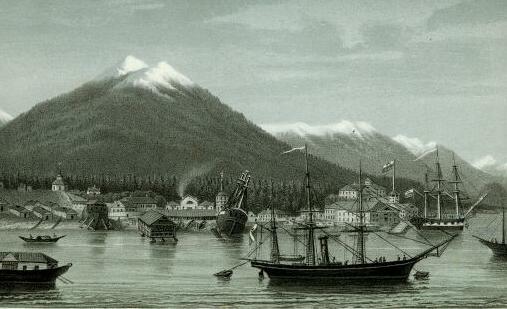 What is today Sitka was chosen to be the location of one of the Russian American Company’s first outposts. Redoubt Saint Michael had become an early trade center with the company’s resources until 1802 when most of it’s inhabitants were slaughtered and the outpost itself was destroyed by the native Tlingit people. The Russian American Company was later forced to pay 10,000 rubles to the Tlingit for the safe return of the survivors. 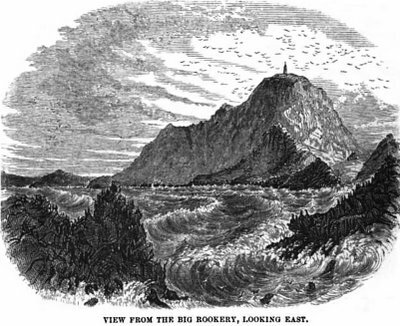 But this attack did not mean the end of Russia’s exploration in Alaska, in 1804 Baranov sent the warship Neva to launch a counterattack on a fort built by the Tlingit in an attempt to reclaim the land, this was known as the Battle of Sitka. The four-day attack may have ended in a loss for Baranov had the Tlingit not lost their gunpowder stocks earlier. Accepting defeat, the remaining Tlingit were forced to retreat and the Russian American Company was able to explore and settle in the area once more. A new outpost was built, named Novoarkhangelsk or New Archangel, a reference to the birthplace of Baranov. 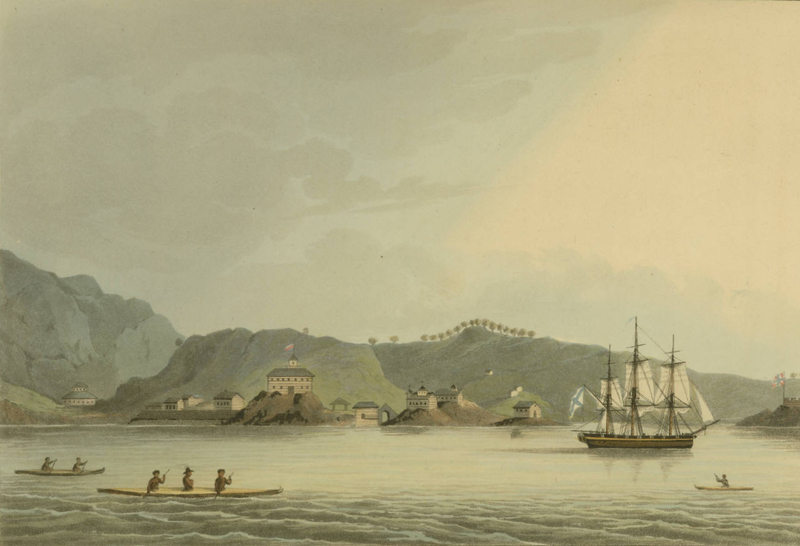 Despite further Tlingit conflict in the area (They later established a fort on the Chatham Strait to enforce a trade embargo with the Russians. 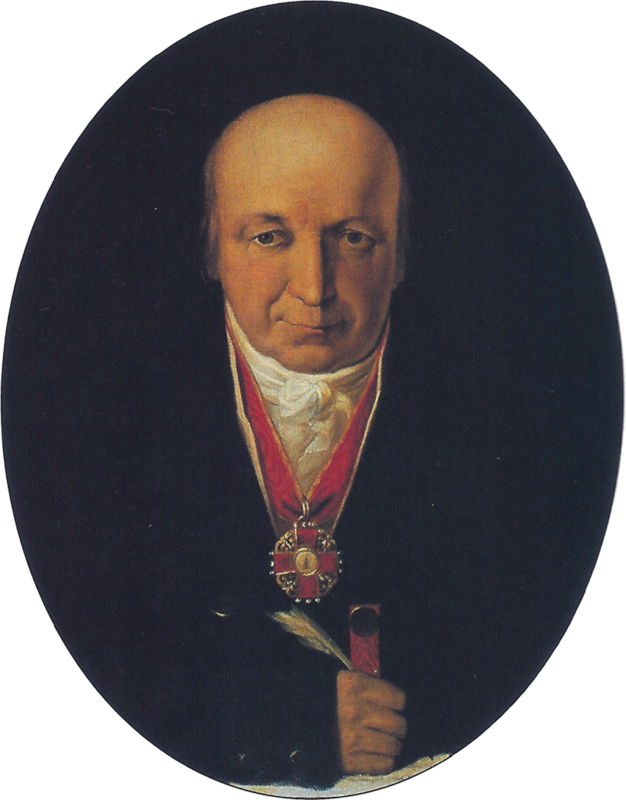 ), progress continued and in 1808, Baranov was selected as governor of Russian America. Baranov himself had already built a life for himself. 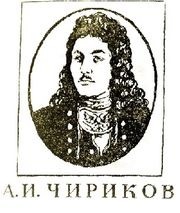 At the age of fifteen, Alexander Andreyevich Baranov ran away from home and later became a successful merchant in Irkutsk, he would maintain the position for ten years and was at one point elected as a member of the Free Economic Society in 1787. 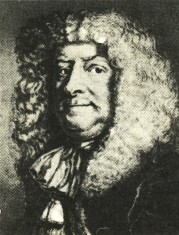 At the end of the 18th century, he met Nikolai Rezanov and gained a successful place in the Russian American Company as it’s chief manager of the company’s Alaskan fur enterprise, this is when he later moved to northeastern part of Kodiak island where he would live for most of his later years. In 1808, Baranov moved the company’s capital to Sitka where sea otters were abundant. 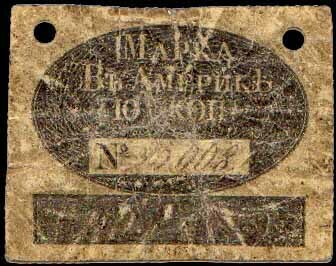 It is also interesting to note that in the time since the Russian-American Company’s official founding, fur prices rose from 1000 rubles to 3727 in just one year (The precise date of this is uncertain as some claim it to have occurred in 1800 and others in 1808). 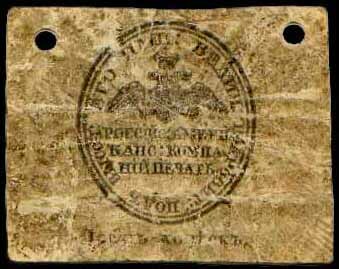 During Baranov’s time as governor, he suggested the use of a special currency for hunters in America. This is why in the years of 1816-1832, the RAC board of directors, with the permission of the government, provided it’s hunters with specially-printed banknotes in lieu of rubles in order to “facilitate settling accounts with the hunters”. The tokens, which were made of either parchment or walrus skin, were used to pay workers of the company, these tokens could later be used to purchase anything from supplies to alcohol in the company’s settlements. Although the exact range of use for these tokens is not known, it may be possible they were used in other colonies as well as several were found in California’s Settlement Ross. While he was given much power, he would often mention of the Russian government’s failure to provide additional support (this would later lead to the company’s downfall), reflecting on the challenges faced by many Russian traders in America like himself. Overcoming this, he was able to convince Native Americans to expand their hunting regions for the good of the Company’s prosperity, in return he built several schools for their support. In 1795, Baranov, who was concerned with the rise in trade with the local natives, established a city six miles east of present-day Sitka from land purchased by the Tlingits, this town would later be called Mikhailovsk. But just seven years after it’s founding, the local native population attacked and burned the city, further widening the gap between the native and Russian trading populations. Soon after the attack, Baranov would return the attack by destroying the nearby Tlingit village with a warship. 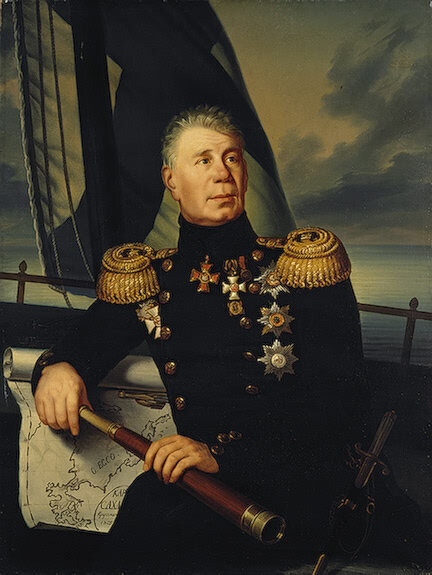 Although soon after his work in Russian Alaska, he was replaced in 1818 by Leontii Hagemeister of the Russian navy after rumors Baranov secretly sent funds from the company to American banks (this was most likely done deliberately in order to allow the Russian navy to coordinate the company’s actions). After this was disproven, Baranov’s son-in-law, Semyon Ianovsky was given the title of Chief manager and governor, followed by eleven others. Overall, Baranov’s retirement and demotion presented more troubles to the RAC that the new governor was not able to change. Hagemeister and Baranov later set sail for Russia, stopping only at several Dutch settlements on the way. Unfortunately, Baranov fell ill during this time, later dying enroute to Russia. Following Baranov’s death, the company’s operations in Alaska and the Aleutian island continued to flourish. This was also a time when many fur traders (half of which were of European descent) from Siberia began arriving in groups to the Aleutian Islands. The company’s activities also expanded northward up the Yukon River to the village of Nulato, the Bering Coast was explored as well. Amazingly, despite all of the expansions of the company, there were only 833 Russians in Alaska during the course of the company’s existence. 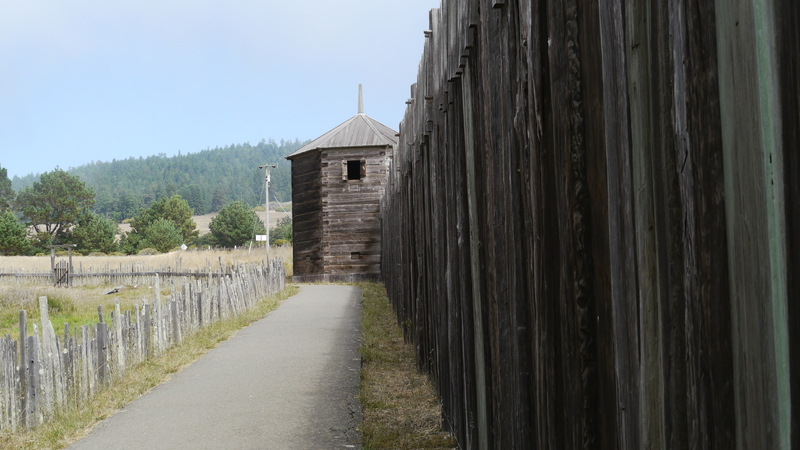 By the end of the 18th century, permanent trading posts were established and much progress was being made. Meanwhile, as the RAC’s business in Alaska grew, the Tlingit (whom the company had chased off the land earlier, returned in the hopes of creating an agreement with the company. After negotiations, the company allowed the Tlingit to return in exchange for food provisions such as deer meat and potatoes (the Russians eventually taught the natives how to plant potatoes). The deal came of great benefit to the Russians as shipments from Russia were took many days to arrive and were often very expensive and food supplies were at many times scarce. Although the progress of the company came with a price, because of lack of manpower necessary to hunt the native wildlife, the local Aleuts were forced to work for the Russian hunters. As competition between various sub-companies increased, the Aleuts were pushed to work harder. 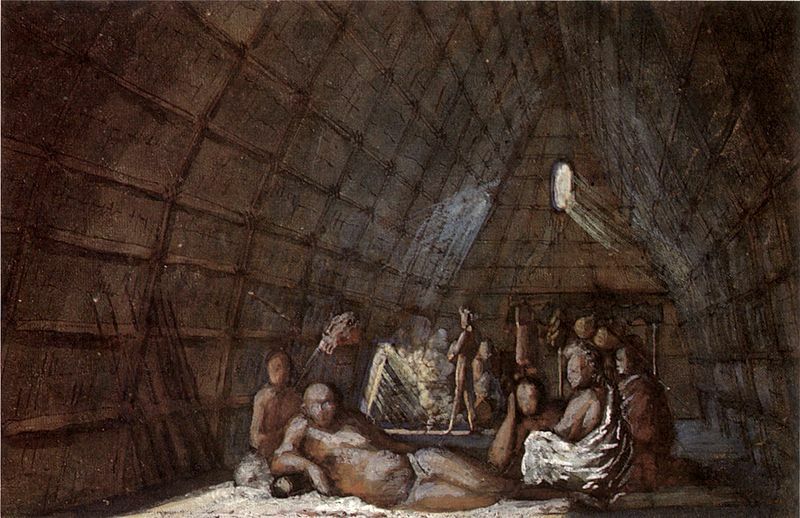 Despite Catherine the Great’s requests to approach the natives with good will, many of the Aleuts who refused to work were sent out of their villages or taken hostage. 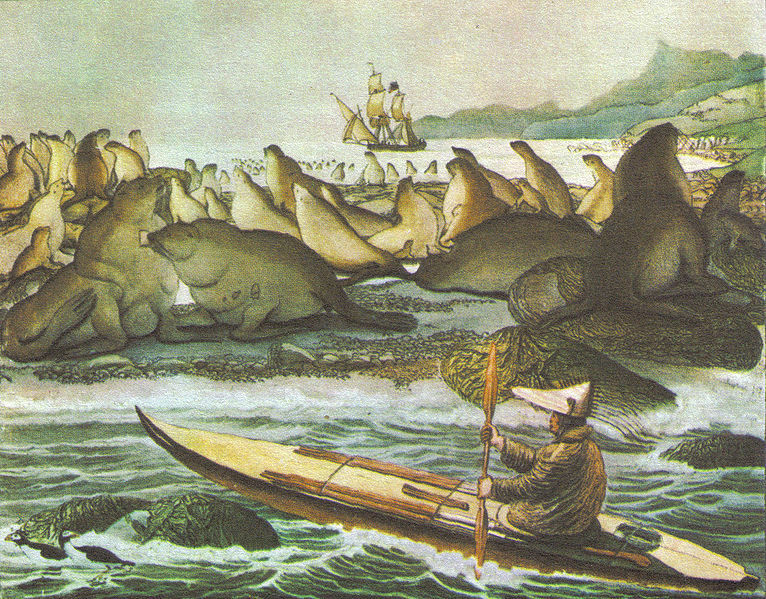 The plight of Aleuts continued to worsen, well after the population of the marine animals began to decline, the natives were forced to go to greater lengths to find new otter populations to hunt in order to keep up with the growing trade economy created by the company all while suffering from the diseases brought over by the Russians. Many of the Aleutians were angered by this, causing several revolts across the islands. 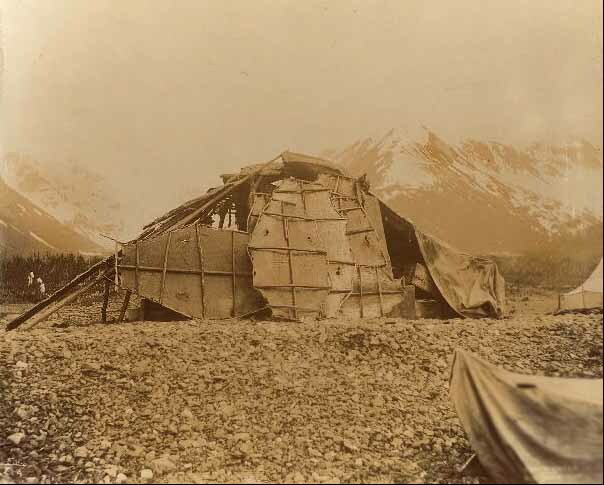 Although there were several several victories, this incited the company’s wrath and retaliation soon followed, in which they returned with further violence and destroyed much of the Aleut’s boats and hunting tools. 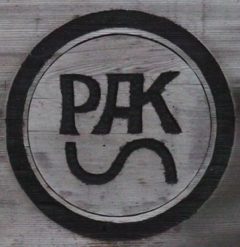 The company’s rapid development was due in part to several important figures. 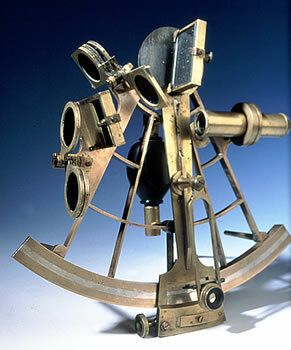 None more perhaps, than Nikolai Petrovich Rezanov, one of the company’s most famous explorers. Born in St. Petersburg on March 28, 1764, the man was already famous for being part of the first Russian circumnavigation of the planet as well as possibly being one of the first Russian ambassadors to Japan, he was a large supporter of Russian colonization into America. 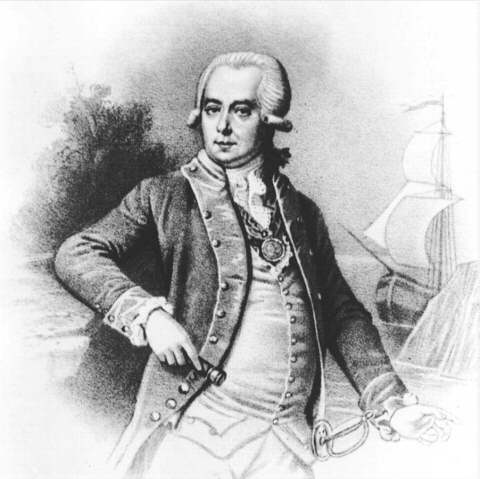 Rezanov fast became involved in the Russian expeditions to America after meeting his father-in-law, Grigory Shelikhov and learning of his goal to gain full control of the fur trade in Western America. 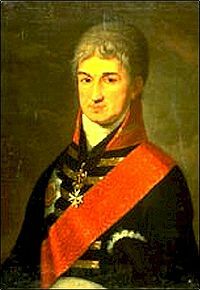 Until Shelikhov’s death in 1795, he worked as a small-time partner of the company, after which he became the front of the company’s actions. Following Shelikhov’s death, Rezanov purchased a boat which he used to set sail to California’s Spanish settlements in the hope of striking a trade deal for the sale of American and Russian wares and to create a treaty in which the Russian colonies of America may be supplied by the Spaniards. Rezanov landed in April of 1806 in San Francisco after a perilous voyage across the Pacific. The success of this deal would mean a great deal to the company in Alaska, as soil in the land was poor and offered little to no support to farmers seeking a steady food supply. 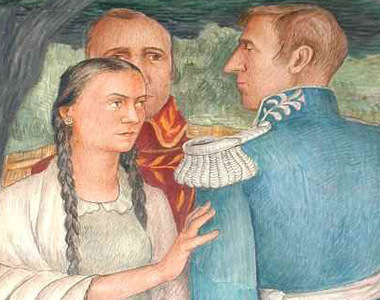 After learning of Spain’s law forbidding trade with foreign colonies, Rezanov was on the verge of failure had it not been for his love interest (and later engagement) with Doña Concepción Argüello, the daughter of the comandante of San Francisco, Don José Darío Argüello. This, combined with his personal skill as a diplomat, was able to suade the Spanish to create the treaty. Six weeks later, Rezanov had set sail with Spanish supplies and to return to the Russian empire in the hopes of receiving consent from the throne to marry Concepción Argüello. With high hopes, he made several stops in New Archangel and Kamchatka and continued on his way to St. Petersburg. 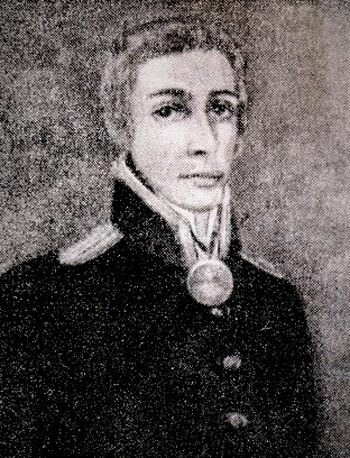 Unfortunately, disaster struck and Nikolai Rezanov died of cold and tiredness (one story states he fell off his horse and later died of his injuries) en route to St. Petersburg on March 1807, never to see Concepción Argüello again. Despite his death, the agreement with the Spanish colonies ensured the furthering of Russia’s ventures in America. 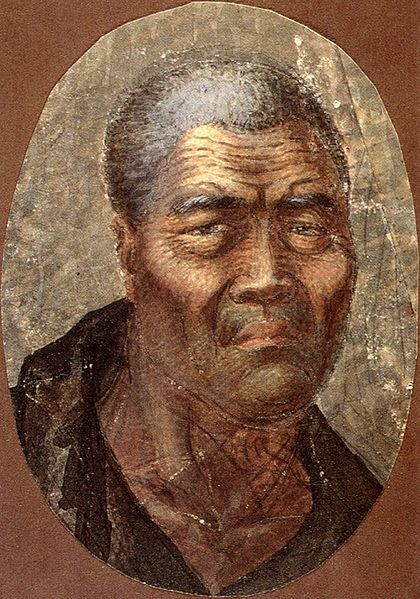 Concepción however is said to have never learned of Rezanov’s death, and waited 35 years for his return after which she took on the name of Maria Dominga and became a nun in Monterey, California. Following the meeting of Rezanov and Comandante Concepción and fulfilling the promise to Tsar Paul I to expand south, the RAC began to establish it’s operations in California. 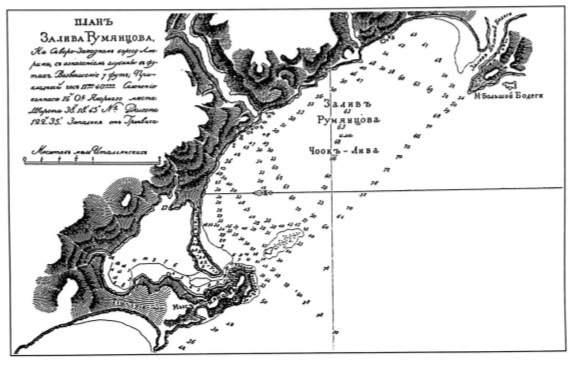 In 1809, three years after Rezanov’s visit to the Spanish, Port Rumyantsev was created in Bodega Bay. 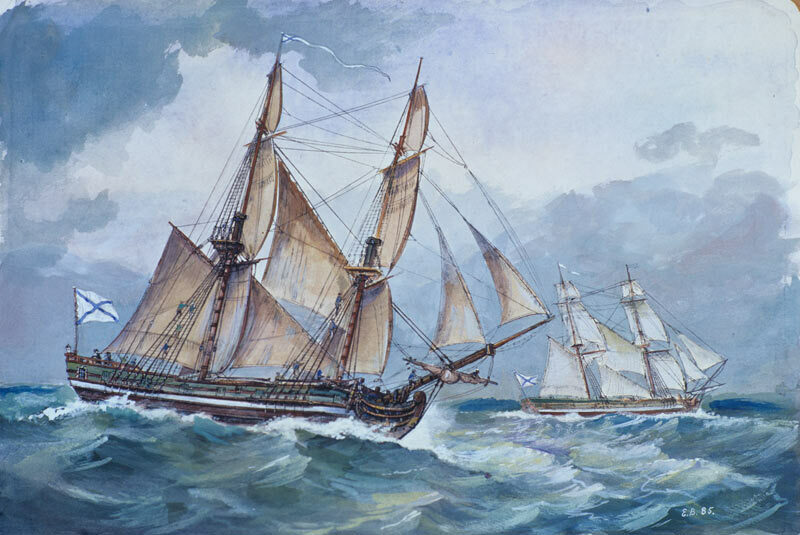 While Spanish law forbade trade with foreign ships, Port Rumyantsev was willing to trade with any ship, making it the first port allowing foreign trade in California as well as the first to build ships on the western coast of North America, eventually producing a total of four ships. 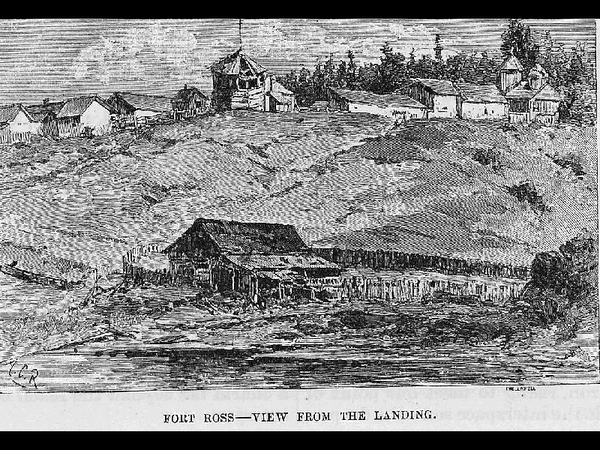 This port would later help pave the way for the company’s most well-known establishment, Fort Ross, which still stands today. 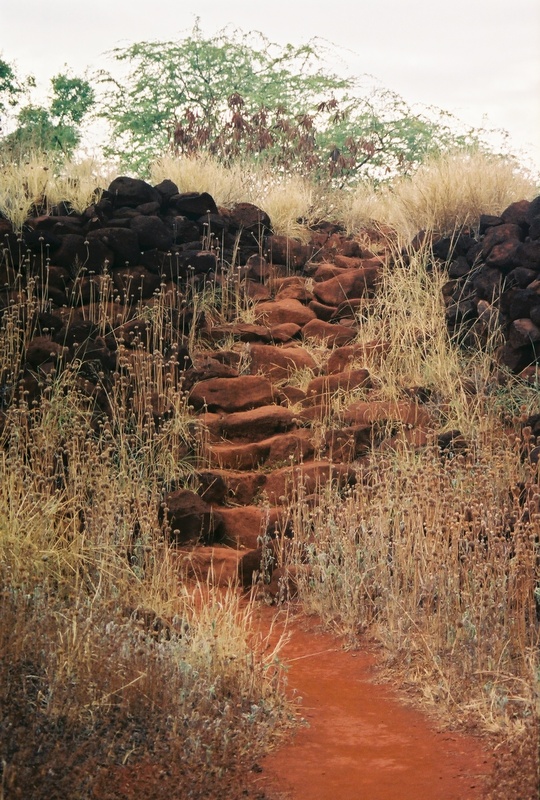 The fort’s beginnings are something of interest, the land which the company had chosen for the settlement had been visited several times and little progress was made in the founding of the fort. One of the first visits to the area was during a joint sea venture with American sailor Joseph O’Cain following a shortage of Otter in Alaska. As Baranov predicted, the California bay was found to have substantial otter populations, although permanent settlement was not made. This changed when settler Ivan Kuskov arrived on the land in March of 1812 with 20-25 Russians and 80 or more native Alaskans. 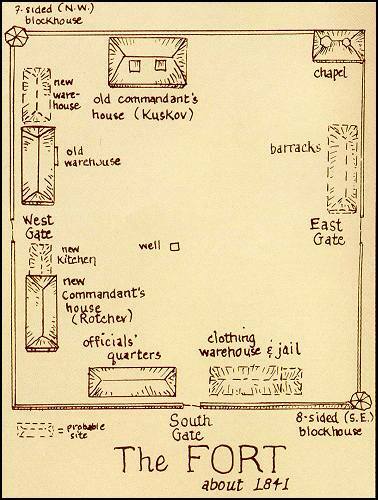 Soon after negotiations with the Kashya Pomo people of the area were made, construction of the fort began, modeling on previous forts and stockades built in Siberia and Alaska. At first, the Spanish, already under threat from other nations colonizing in America, protested the settlement’s creation, claiming it was built illicitly on land claimed by the Spaniards. This opposition did not convince the Russians to change their mind, as the Spanish had lacked the military power necessary to evict them from the coast. 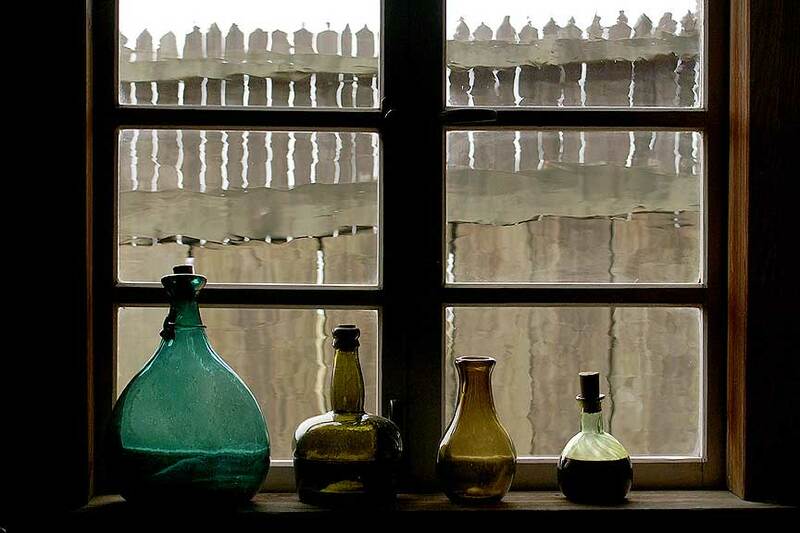 In time, the settlement impressed the Spanish, the fort had a full-time blacksmith (The Spanish were so amazed by his skill, they employed him in several of their missions), imported glass (They were the first to do this in California), and even several surrounding ranches with vineyards (They were also the first to do this north of San Francisco), one even reaching 2000 vines. 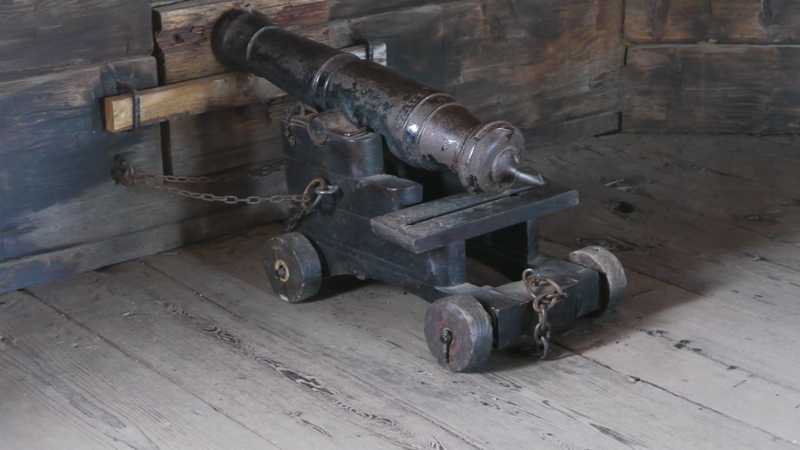 Interestingly enough, the Fort was armed with several rifles and cannons in the case of attack, although in it’s 29-year existence, there was not one instance of attack from outside threats. 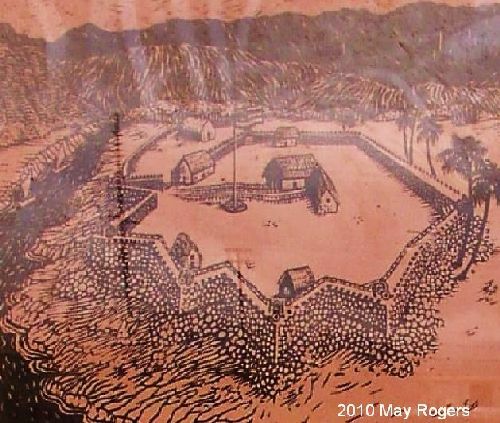 The RAC was not just famous in California for the fort by itself, as several of it’s inhabitants made notable contributions to California themselves. 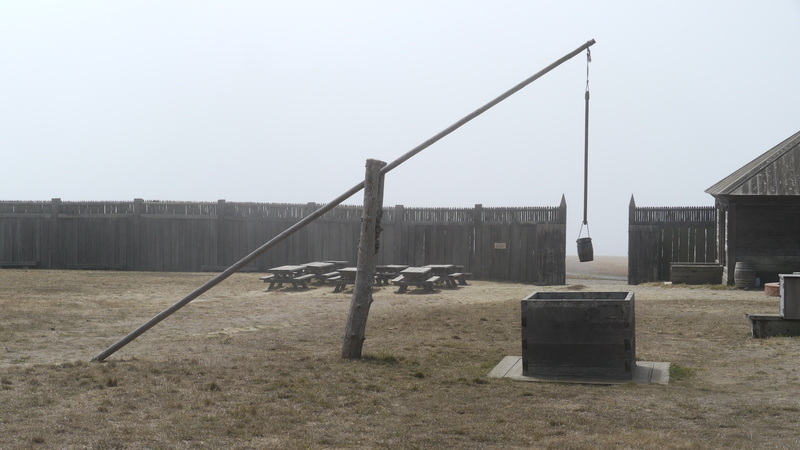 For example, one of the first weather reports in Northern California came from the fort’s agronomist, Yegor Chernykh, who recorded sky cover, air presure, precipitation and wind conditions between 1837 and 1840. The California Poppy, the state’s official wildflower was discovered by naturalists Johann Friedrich Eschscholtz and Ludovick de Chamissio during their visit to the settlement. 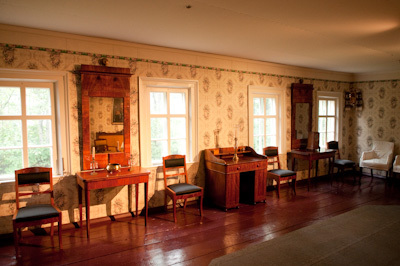 Throughout the time of the fort’s existence, it served as a base of operations for various artists, scientists, and explorers from Russia sent for a number of reasons, researching in various fields. One such scientific initiative was Russian Navy Captain Vasily Nikolaevich Golovnin’s visit to northern California. 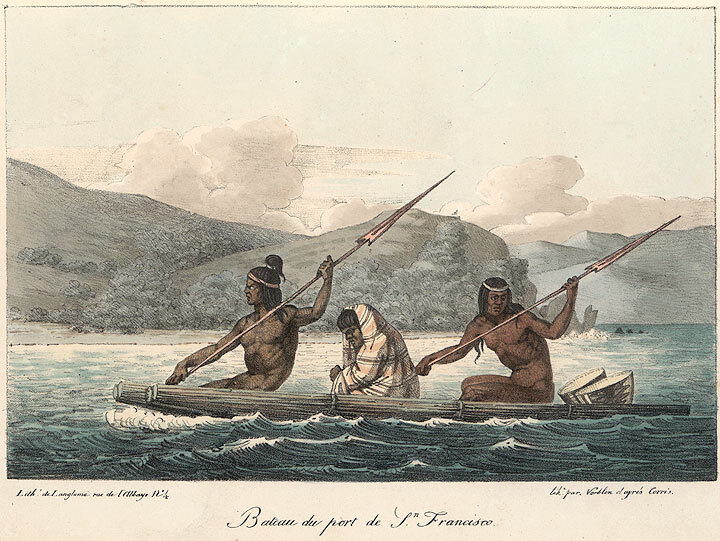 While the captain described his observations of the local Miwok culture and traditions, his main goal was to create a map of the Bodega Bay area, marking water depths and topographical elevations as he went along. 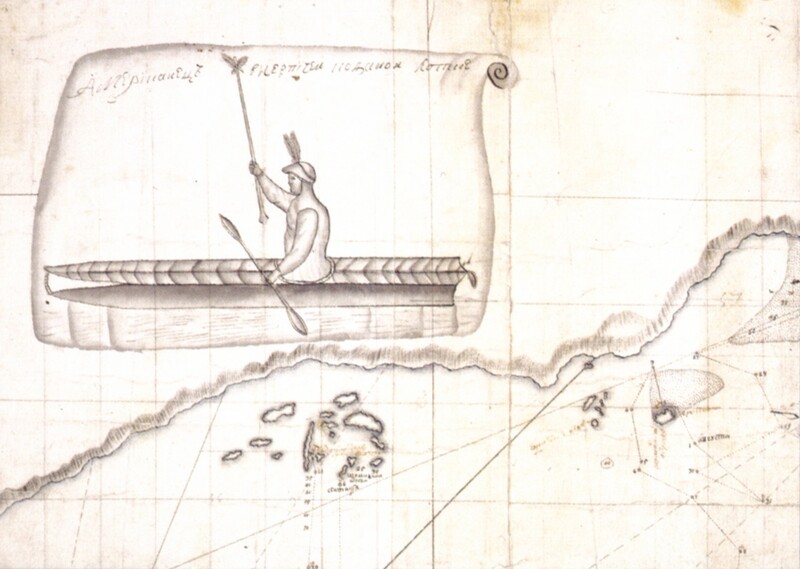 Adding to Golovnin’s contributions, two crew members, Dmitry Irinarkhovich Zavalishin and Mikhail Tikhonovich Tikhanov also provided insight into Miwok and Spanish population in California, greatly contributing to the Russian knowledge of the area. 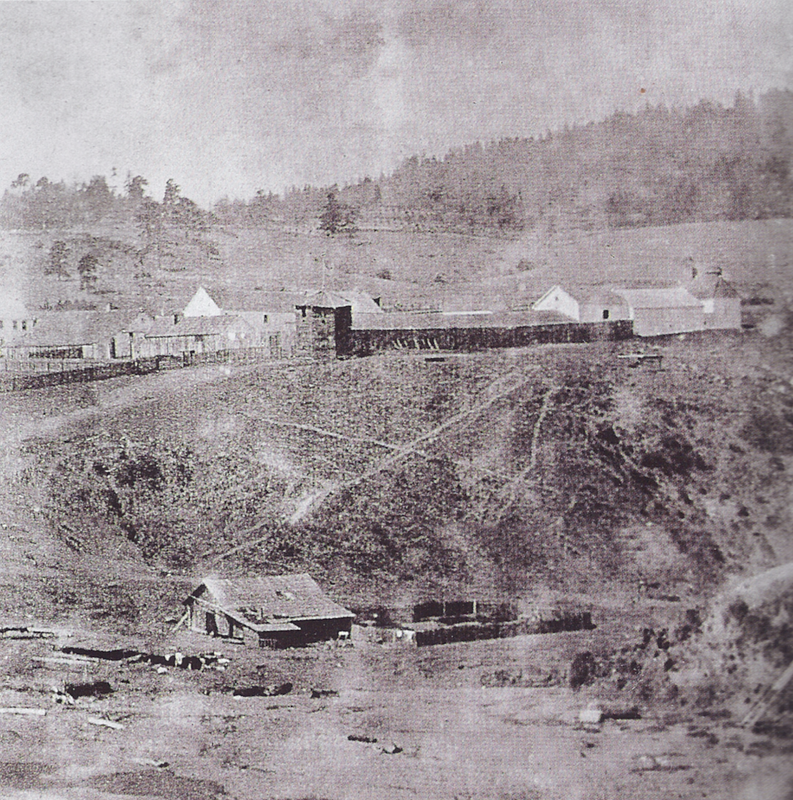 Another important scientific project undertaken by the RAC happened during the early 1830’s when Baron Ferdinand Petrovich von Wrangell, manager-in-chief of the fort at the time encouraged an investigation of the land inland of Bodega Bay in the interest of expanding the company’s hold on the land. 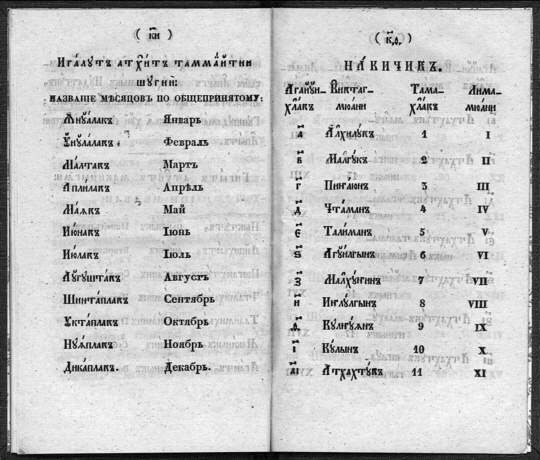 In 1833, a detailed anthropological account of the native populations in the Russian River area and the Santa Rosa plain was written by manager Peter Kostromitinov in cooperation with the Imperial Academy of Sciences. This report later paved the way for the construction of ranches further inland. 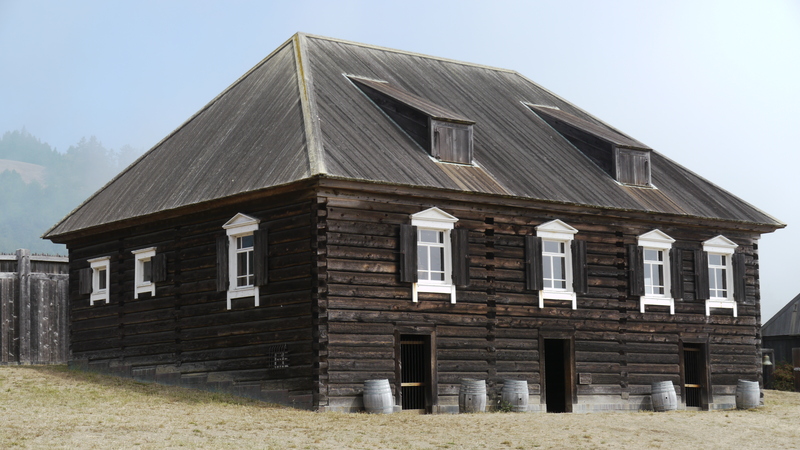 Unlike in Alaska, life in the fort was calm, due in part to the fair weather the area had, in fact, the fort’s last manager, Alexander Rotchev, recalled his stay at Fort Ross as one of the best times of his life. 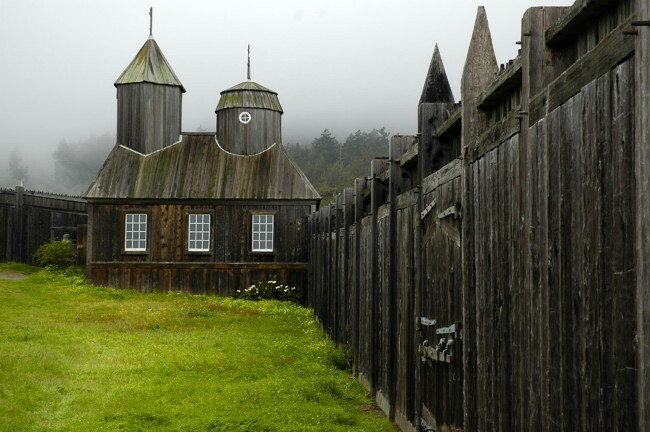 Another aspect of Fort Ross life was religion, by the 1820’s, inhabitants of the fort expressed their desire to have a chapel built in the fort dedicated to St. Nicholas. Eventually the chapel was built, and several icons were sent from Russia. A reconstruction of this chapel still stands today, in it’s original place, with regular services during special events. Occupation-wise, it is said that there were 25 to 100 Russian workers in Fort Ross at any given time, most of these people were brought to the fort from various parts of the Russian empire and beyond usually due to a skill they possessed in a certain craft, be it carpentry, blacksmithing, hunting, or whatever else was of use to the company. 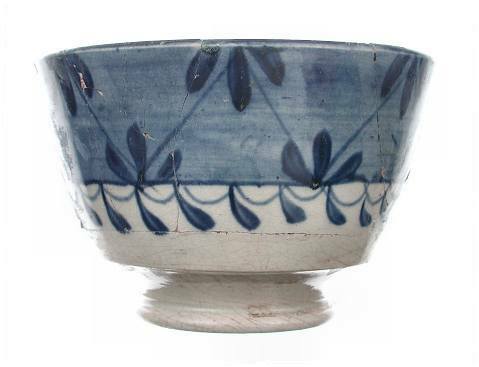 Originally, these workers would be compensated for their labor with a share of what the fort earned from trading, meaning that wages could be either very large at one time and very small at another. Only until 1820 did workers start receiving salaries, although they must first oblige to a seven-year contract stating they shall not trade with natives for personal gain and avoid unproductive behavior, such as drunkenness. 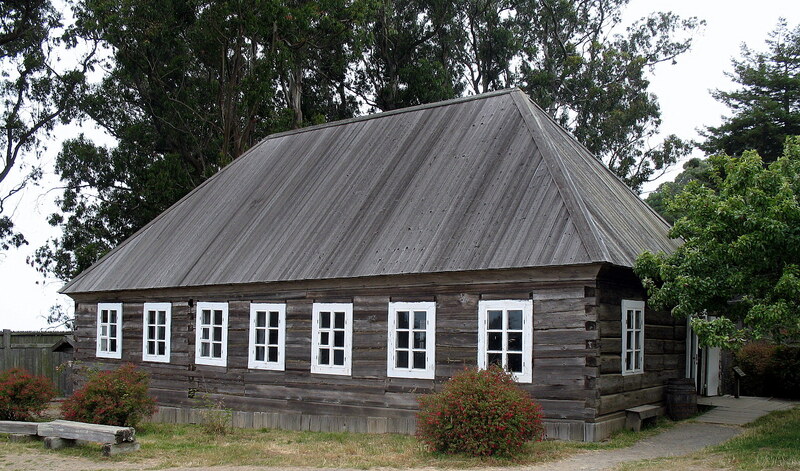 It is said there were 72 salaried employees at Fort Ross, each receiving about 360 rubles each. The Aleut workers however, were paid very differently. Rather than being placed on a contract salary, they would be compensated on the amount of otters they caught. As part of a trade deal, they would given clothes and baidarkas (Aleutian kayaks). 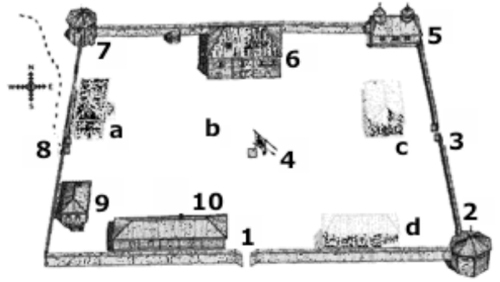 The Aleuts, being the hunting division of the fort, operated very differently. Rather than spending most of their time by the fort, they would work in hunting groups or artels (a Russian term, meaning a cooperative between a group of workers). These groups would be supervised under a Russian foreman and make trips to hunting bases located as far as the Farallon islands where they would remain for days at a time, living under crude huts while going out to sea to hunt for various wildlife. The products gained from the hunt (bird eggs, seal lion meat, etc.) would be processed at the base and eventually shipped to the fort. 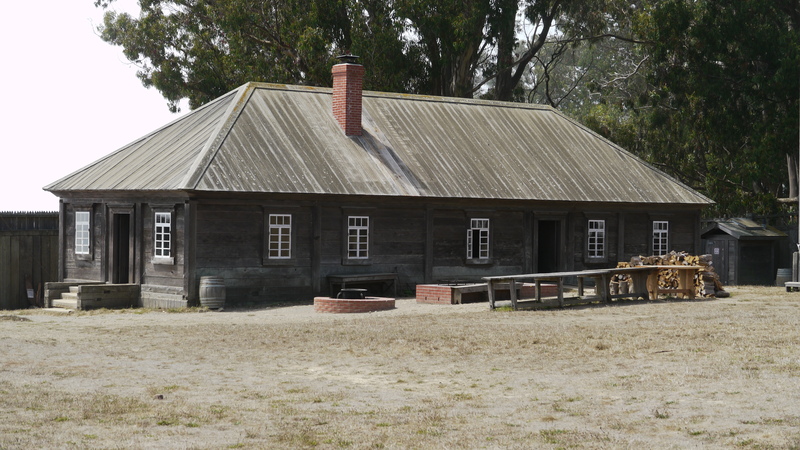 Remarkably, relations with the natives at Fort Ross were very peaceful, as the natives were compensated for their work with flour, meat, and clothes and were offered lodging. Unlike the Tlingits at Alaska, the locals were very open to the prospect of working with the Russians, in fact, they considered them more worthwhile associates than the Spanish to the south. So open were the natives to the company that they eventually signed an agreement promising the neighboring land to the company in return from defense from outside threats. At it’s height, the RAC established trade relations with several countries including Chile, the United States, and China. Besides the company’s animal products like whalebone, pelt, and walrus tooth, it’s main exports included food products, most importantly bread, which rose in demand during the California gold rush. 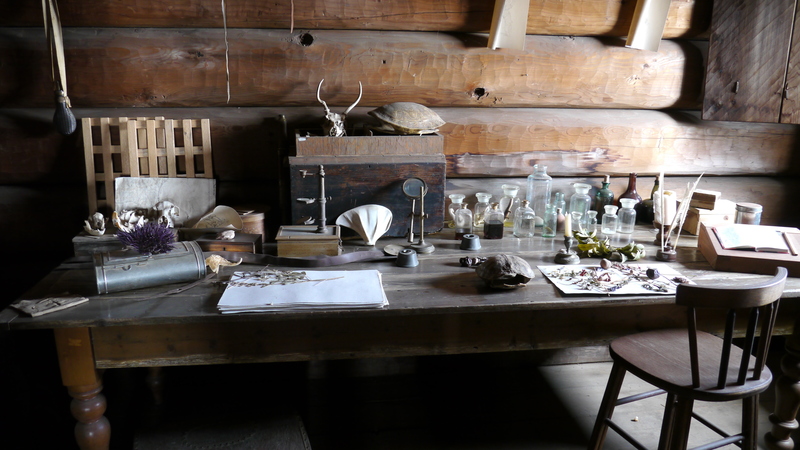 Hundreds of natives were employed to till the land for farming and tend to livestock while the fort’s shops produced a wide variety of products, everything from furniture to clothes to farm equipment. Settlement Ross is argueably one of the company’s most successful ventures. But the settlement’s progress did not come without hardship and misfortune. 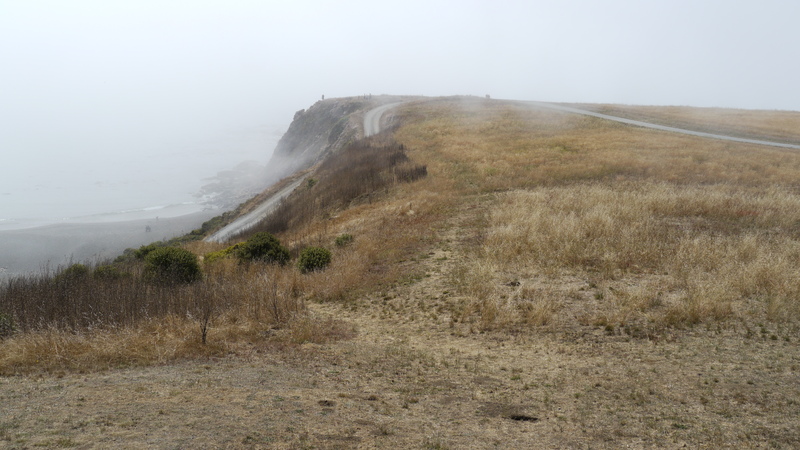 Due to the damp, foggy weather common on the North American coast, much of the surrounding crops began to fail and the local Spaniard population, already discontent with the establishment of Fort Ross, began to create several missions around Bodega Bay in the hopes of impeding any future plans of expansion in the land. 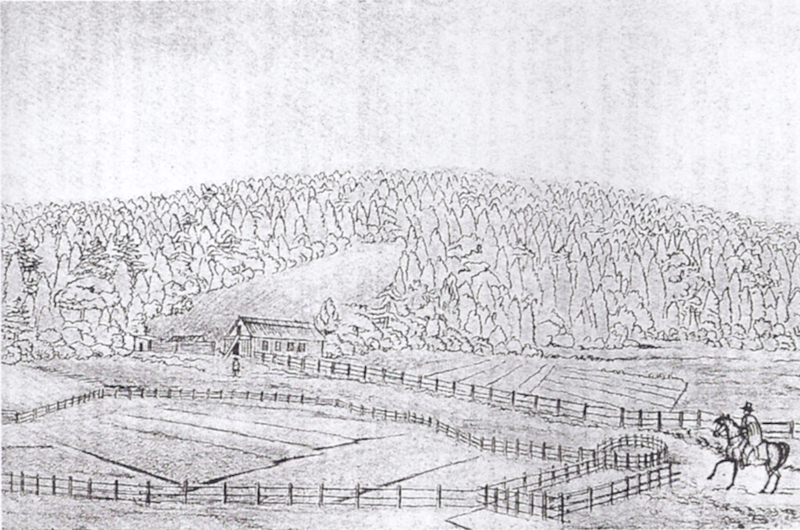 This is when agronomist Yegor Leontievich Chernykh was brought to the fort in the hope of introducing scientific farming and mechanization to the settlement, unfortunately due to the ineptitude the inhabitants possessed with most farming techniques, he was not able to accomplish this. Shortly after, the workers tried their hand at growing fruit trees. Amazingly, their attempt was quite successful, the first peach tree being planted in 1814. Later on, Captain Hagemeister introduced grape from Peru and more peach trees from Monterey. 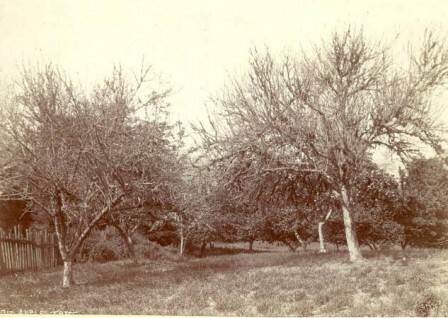 The area where these fruits were grown, known as the Fort Ross orchard, still stands today and includes several types of fruit from trees planted over a century ago. Finally in 1831, the company once again attempted to establish an agricultural profit, this time by building several ranches farther into the land in the hope this would further strengthen the company’s hold on the area whilst increasing the company’s productivity. 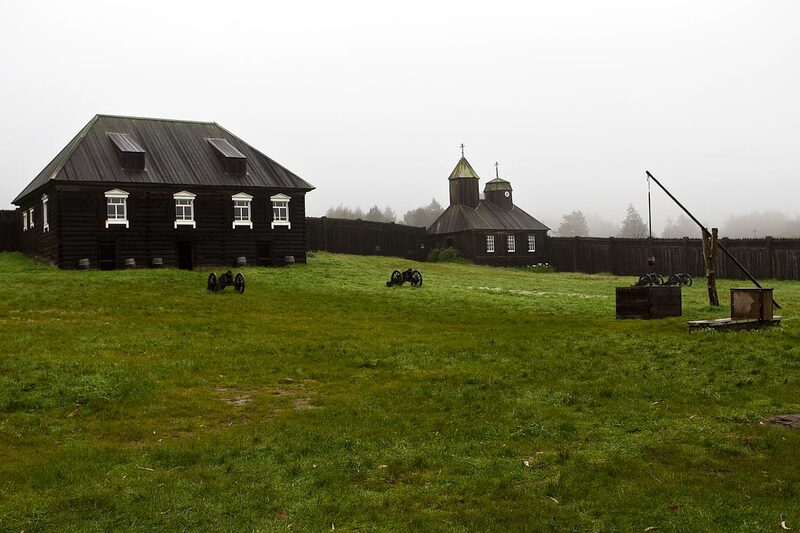 For about eight years, the company maintained three such ranches, the most farthest one being owned by agronomist Yegor Chernykh where he several structures including a barracks. 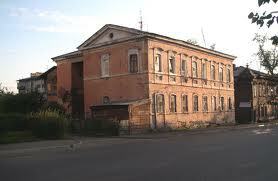 The other ranches were overseen by Vasily Khlebnikov and Peter Kostromitinov, a manager from the fort. Ranch Kostromitinov was arguably the largest of the ranches, it was known for growing wheat, corn, beans, and tobacco. Most interestingly it was chosen to host the birthday of Yelena Pavlovna Rotcheva, the wife of fort’s manager, Alexander Rotchev, it was said the celebration of dancing and music continued for almost two days and included guests from Fort Ross, Sonoma and several foreign visitors. 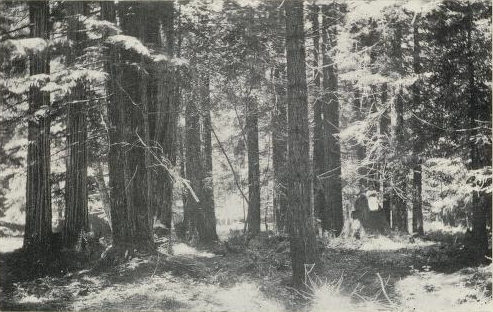 The forests surrounding the settlement proved to be very useful to the workers as the diversity of tree types allowed for a wide range of products to be made, from barrels to navigational equipment. But what interested the company most was the prospect of shipbuilding. 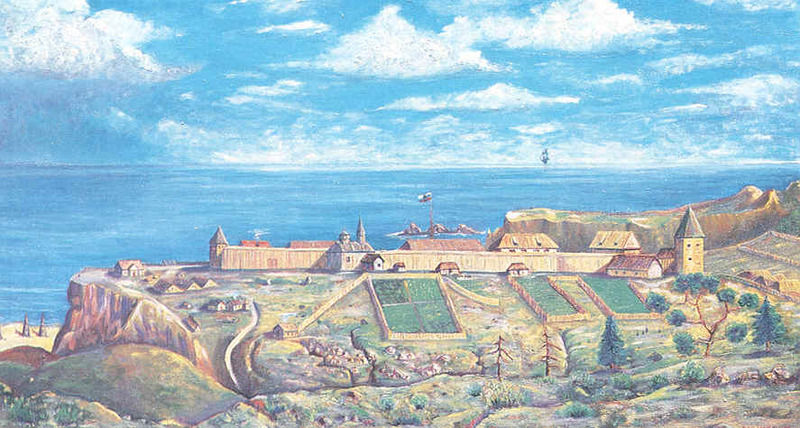 The development of shipbuilding at Fort Ross would mean the improvement of trans-pacific communication and trade. 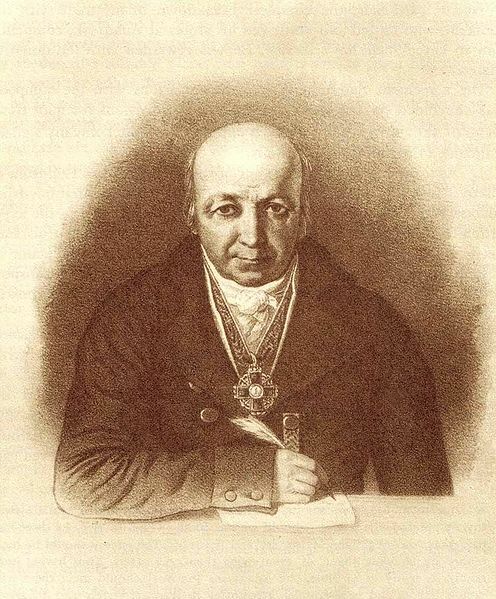 This interested Baranov, who in 1817 sent Vasily Grudinin to look over the project. In the next few years, the cove by the fort was home to the creation of three brigs and a schooner, costing 20,000 to 60,000 rubles each. Unfortunately, the company later discovered the oak was not fit for large voyages, as such, the boats built at Fort Ross were only used for short trips to Alaska or Monterey or at the most, Hawaii or Okhotsk. 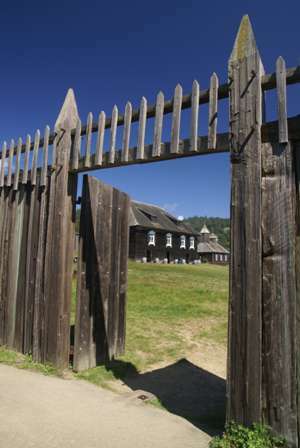 Fort Ross was also home to several smaller productions, one such being brickmaking which began when several amounts of clay were found nearby. 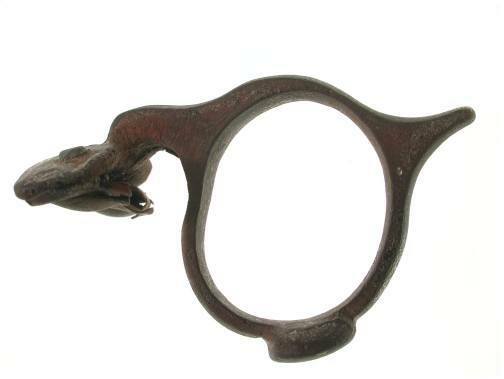 Other commercial ventures included tanning, milling and the production of several blacksmithing products, although they were not major forms of profit to the fort. Problems arose in 1821 after Mexico gained it’s independence from the Spanish, thereby allowing greater foreign trade with other powers. This meant that the company would now have to compete with American and British traders, forcing them to lower the cost of many of their goods. 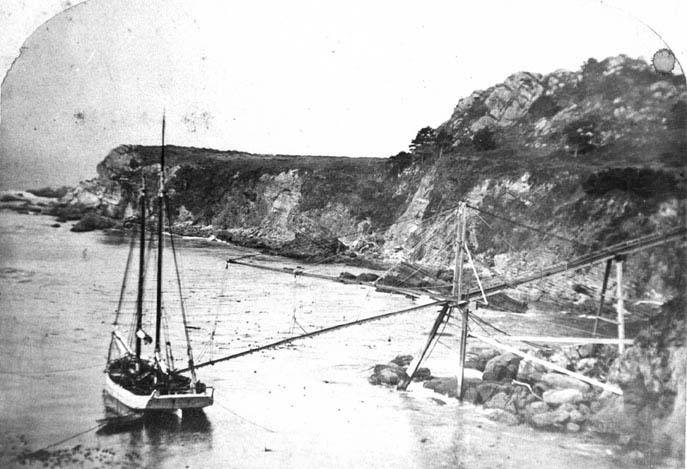 But despite this, the Russian control of Bodega bay worked in their favor, as Mexican ports now forced traders to pay a new anchorage fee and the RAC did not, which attracted several foreign ships to it’s port. Regardless of this, the settlement’s failure at growing crops (which it’s founders had hoped would be it’s main export) led to an economic downturn for the company. Even without a settlement, elements of the company returned during times of economic promise. 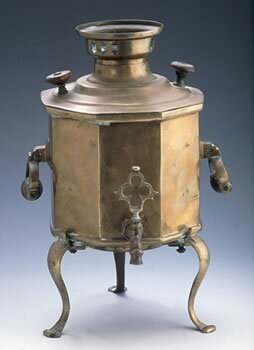 During the California gold rush of 1851, Alexander Rotchev, the last manager of Fort Ross obtained a patent for California’s first gold washing machine. In addition, Peter Kostromitinov, another manager, arrived to San Francisco around the same time to work as an agent for the company. The RAC was also known for being a supplier of ice to San Francisco during that time as well. 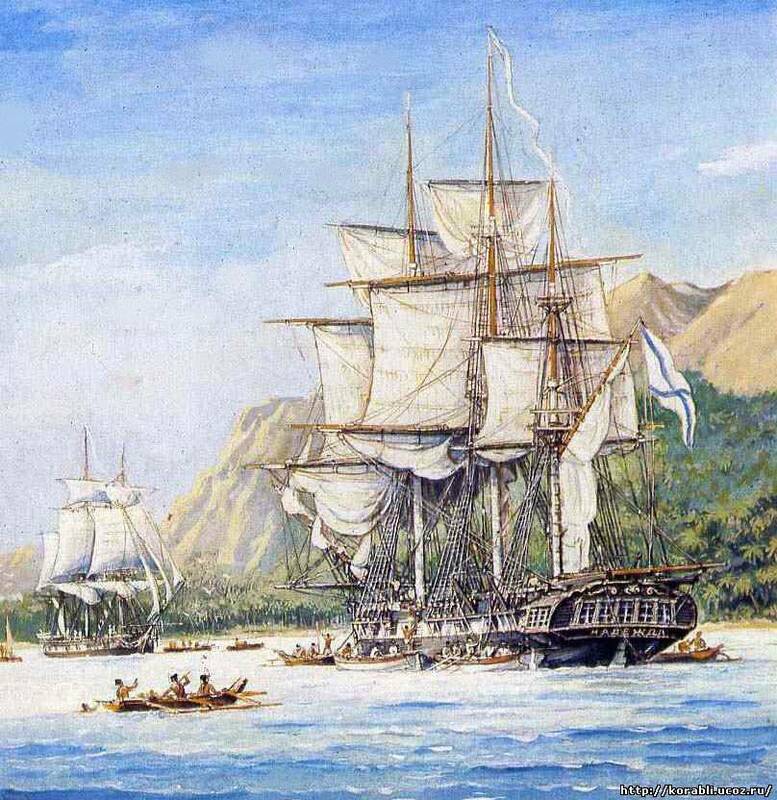 Several years prior to the RAC’s venture into establishing a settlement in California, a number of explorers on the ships Nadezhda and Neva, under the command of Lieutenant Ivan Fedorovich Krusenstern, were tasked with finding potential business partners and land for new outposts happened upon Hawaii in 1804. As King Kamehameha was busy invading Oahu at the time of their visit, the explorers instead spoke to King Kaumualii of Kauai. Although Kaumualii was not interested in trade, he asked the Russians to defend his people from the armies of Kamehameha, although Krusenstern refused as he could not afford to lose any men and his crew lacked the necessary firepower to lend any assistance. Two years later, King Kamehameha, hearing of the company’s interests in trading with the Hawaiian people, sent a ship towards Sitka to acquire food products and sea otter pelts, this was the first in a series of planned expeditions to trade with the company. 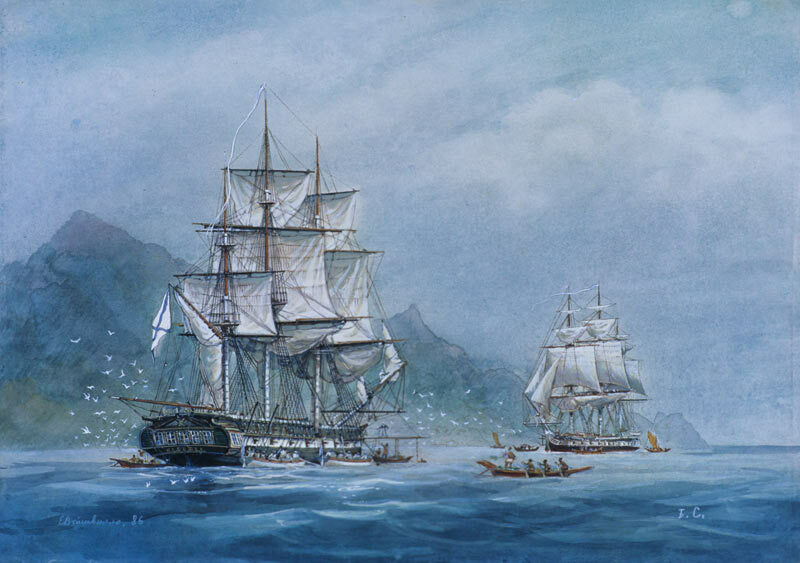 In 1808, a second ship was sent by Kamehameha in the interests of trade, relations with the company and the natives were warm, in comparison to the company’s history of conflicts with the Alaska natives. 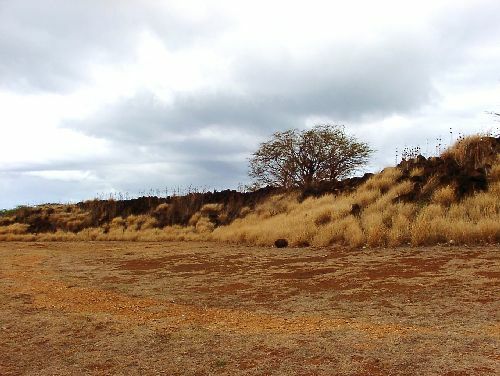 Although sometime between October 1814 and January 1815, the Russian trading ship Bering was wrecked on Waimea Bay because of a gale and it’s cargo was seized by King Kaumuaii. Upon learning of this, Baranov sent Lieutenant I. A. Podushkin and surgeon George Anton Schäffer to recover the cargo using any means necessary. The negotiations with the king went better than anyone could have expected. 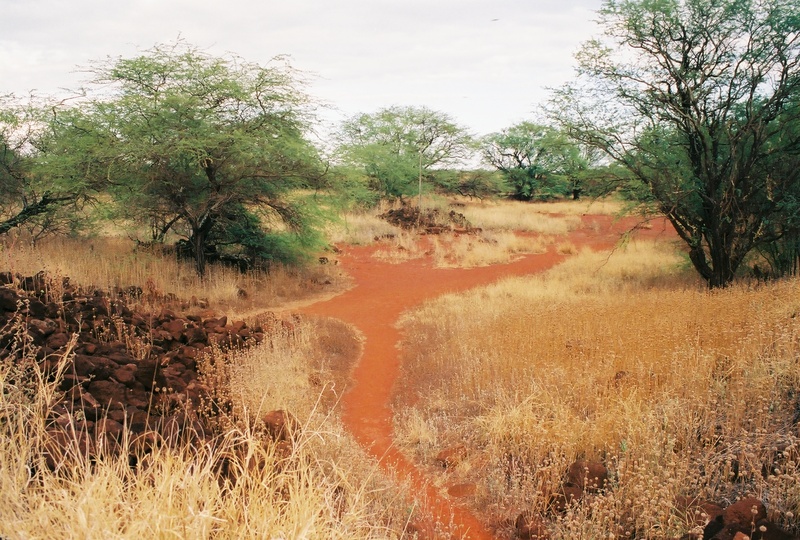 In addition to not only returning the cargo, Schäffer gained the company a land grant on the island of Kauai, fishing rights, and even livestock. Later Kaumuaii expressed his desire to ally with Russia in the hopes of taking back the island, and if possible, all of Hawaii. Later, an agreement was created in 1816 promising Russian military protection in exchange for exclusive trading rights with the land and the ability to build a trading post on the land. Schäffer’s work in Hawaii allowed him to acquire the port and valley of Hanalei. 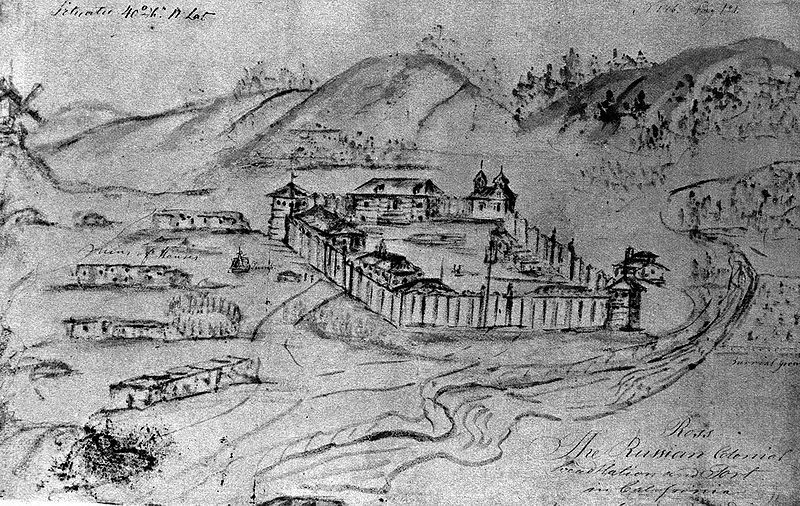 There, he began the construction of Fort Elizabeth and several other small settlements on the coast, Hanalei would later be renamed Schäfferthal, by now, the Russian influence on the land was once again becoming evident. As the company’s previous ventures have shown, disaster would no doubt follow. 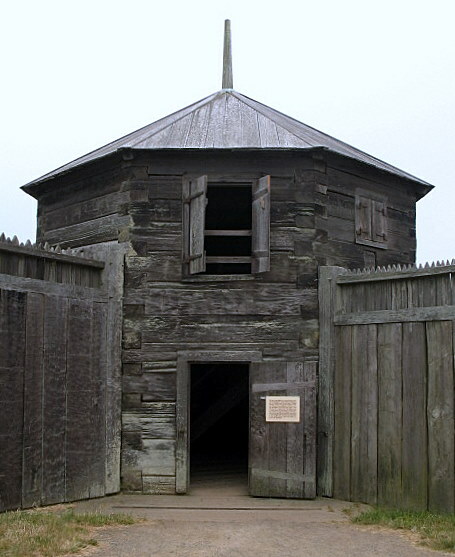 Shortly after the construction of the Fort, the local natives revolted and Schäffer was told to return to Sitka by Baranov. A year later, Schäffer was forced off Waimea by a group of natives and Americans aboard his ship and sent off. In a final attempt to claim Kauai for Russia, Schäffer later sailed for Hanalei and Honolulu, hoping to gain support and reinforcements from either the locals or Baranov. Failing in gaining any support, Schäffer eventually left for Europe through an American port, decisively ending the RAC’s involvement in Hawaii. In later years following the establishment of The RAC’s operations in California and Hawaii, the company’s monopoly of the Alaskan fur trade began to recess. 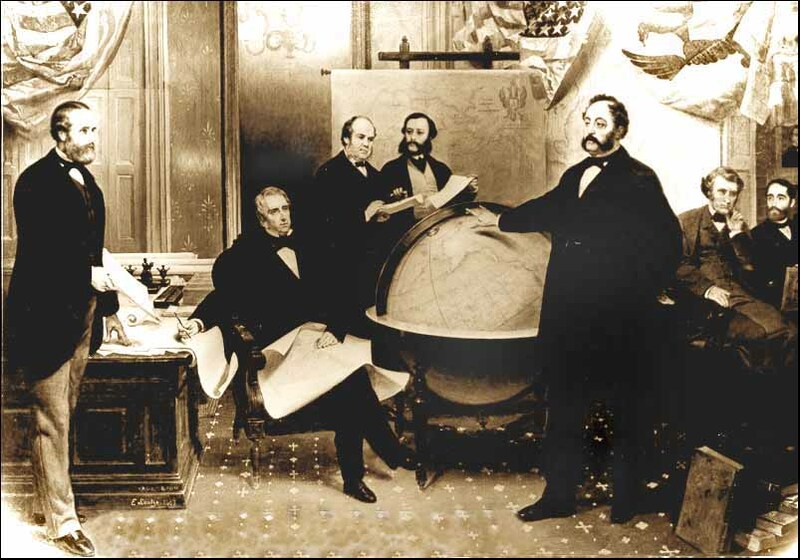 After a failure to block the creation of non-Russian trading posts in 1833, the Hudson Bay Company began operating on the southern edge of Russian America. This, combined with the actions of the British-Canadian firm began to present a challenge to the RAC. Another looming issue to the company was it’s dependency on the American suppliers as they were able to sell furs to several markets unavailable to the Russians and were faster to arrive than Russian ships. All the while, this encouraged the Americans to hunt on Russian-claimed territory, this is when in 1824, the Russo-American treaty was declared. The treaty stated that all land above Latitude 54°, 40′ North belonged to the Russian enterprise. Similarly, a treaty with the British, disallowing them from hunting on Russian American land was made in 1825. But the company’s trouble with the English and Americans didn’t end there. 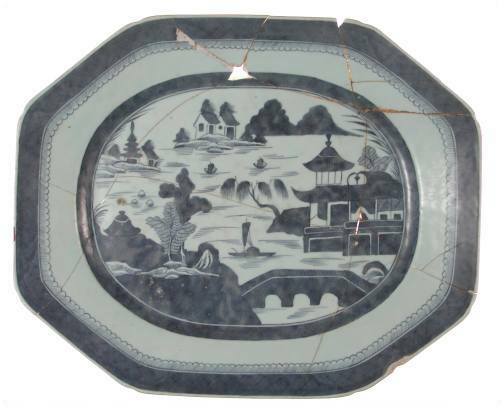 Earlier on in 1821, the company’s charter was renewed and in the charter it was stated the company needed to avoid contact with foreign businesses. This worked against the company as they had become dependent on the supplies provided by the Americans, furthering it’s economic troubles. All the while, throughout the company’s ventures and actions in America, it was tied very closely to one organization, the Russian Orthodox Church. 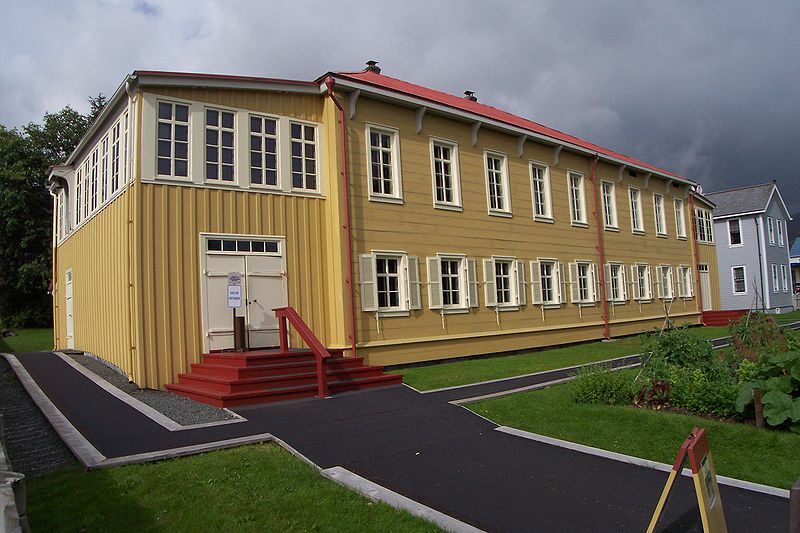 While there were smaller religions present on the company’s settlements (those being Lutherans and Protestants, practiced by the Swedes and Finns who worked at the company), none was more influential on the company than the Orthodox church, which existed in Alaska as early as 1784. 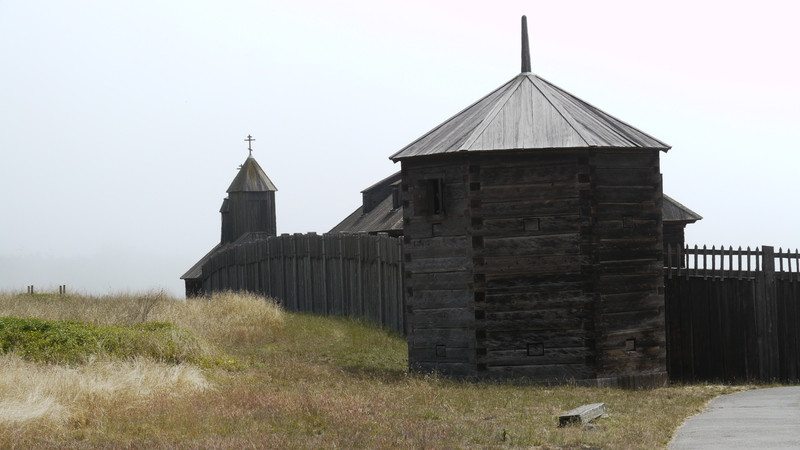 Throughout the company’s existance several figures of Orthodoxy were very important to the religion’s development in Alaska, specifically the likes of Bishop Innokentii. 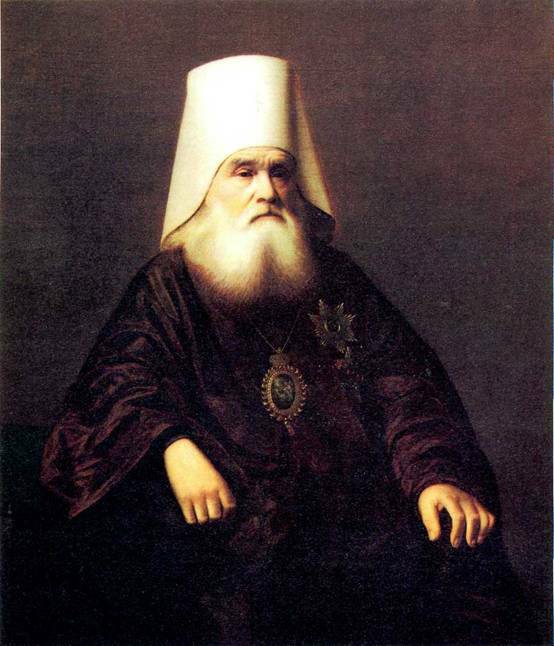 Born as Ivan Evseyevich Popov in 1797, Saint Innokentii entered the Irkutsk Theological Seminary where he was renamed as Ioann Veniaminov and later became a deacon at the Church of the Annunciation in Irkutsk. 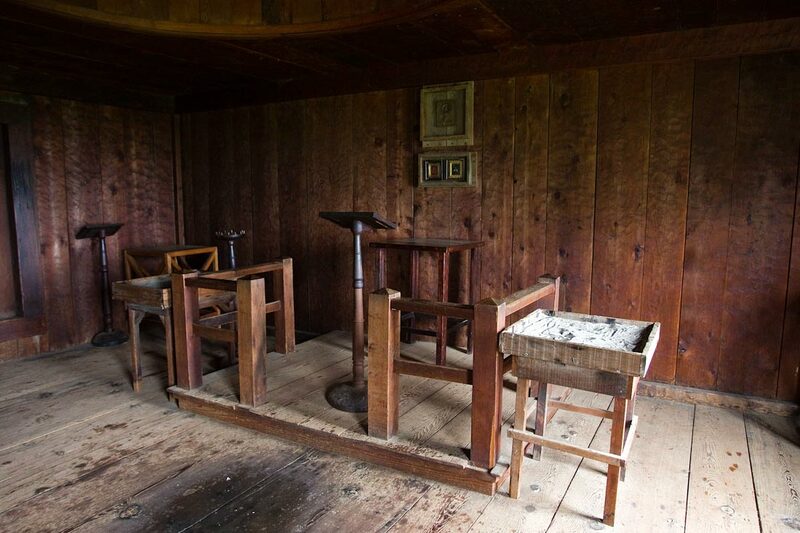 Prior to 1823, Ioann lived a pious life until he was asked by Bishop Michael to go to the Aleutian islands of Alaska. 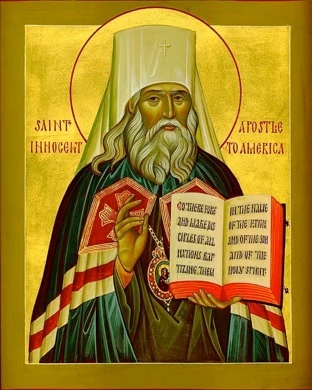 A year later, he and several members of his family arrived on the island of Unalaska, beginning the first major step in the spread of Orthodox Christianity in Alaska. Following the construction of a church, Veniaminov began to give services to the local native population, which was converted prior to his arrival while traveling to other islands in a canoe (usually against violent storms) in order to preach to other populations of the native people. In doing so, he would become acquainted with the local dialects, specifically Unagan, which he translated several religious texts into. 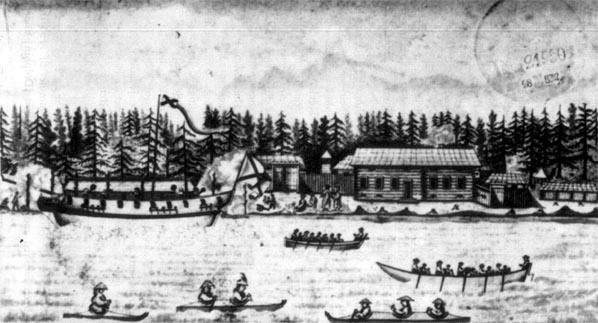 In 1834, the priest was sent to the Novoarkhangelsk settlement where he would later built a permanent home/school and dedicate himself to the study of the local customs and languages of the Tlingit. 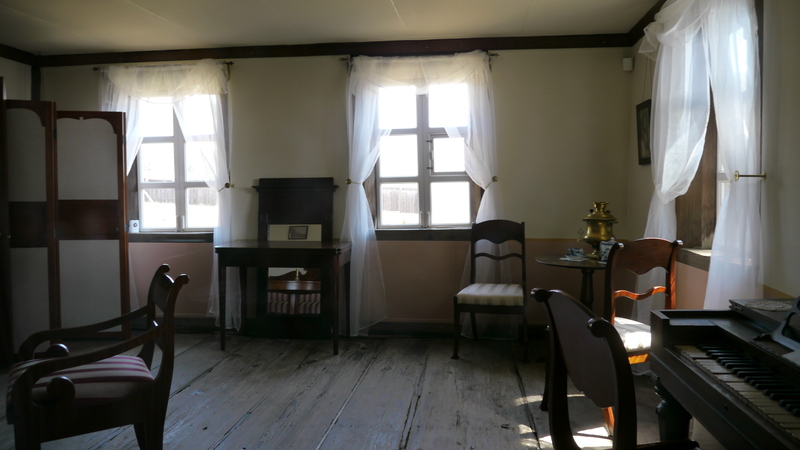 In the summer of 1836 he visited the settlement at California, where he held weddings, funerals, baptisms, and sermons, among other things. In his memoirs, he noted that about 39 of the fort’s 260-person population were baptized natives of the Orthodox faith. 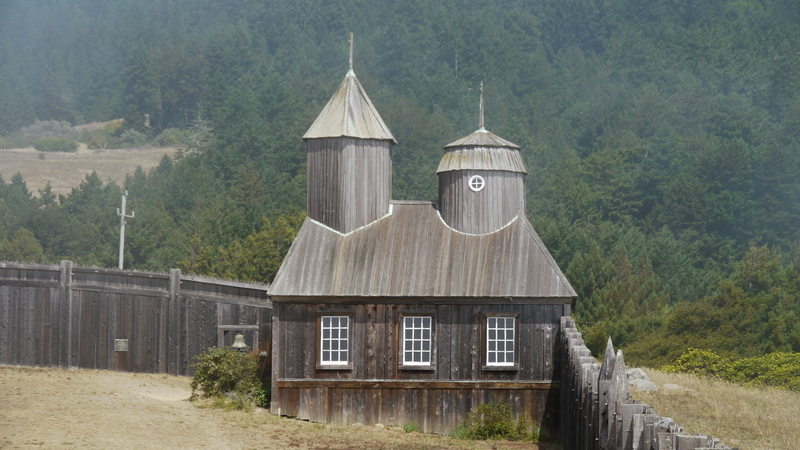 In addition to his work in Fort Ross, he made several trips to the Spanish missions of the San Francisco Bay Area where he attempted to establish relations with the local Catholic population. For the several years following his return to Alaska, he would help educate the local people until his trip to Russia in 1838 and his subsequent vow as a monk, although this was not the end of his work in Alaska. 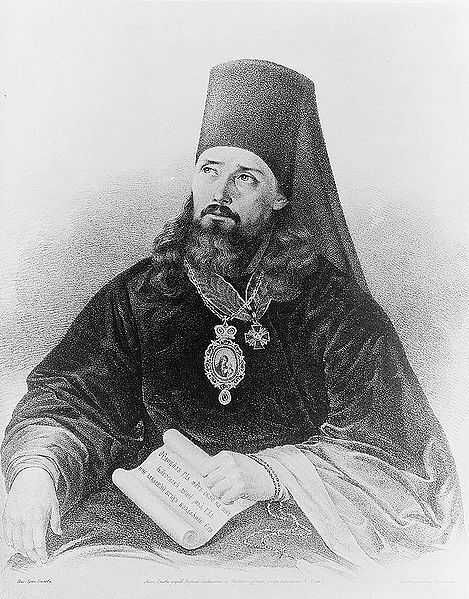 In 1841, St. Innokentii, who was now archimandrite, returned to Alaska and continued to translate religious texts into other native dialects. 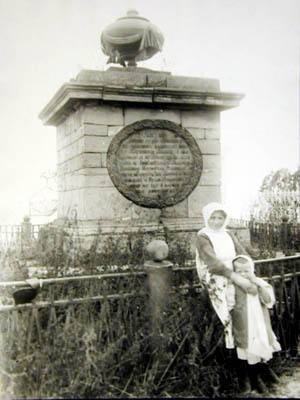 At this time, the Church and the company were in a feud over the treatment of the natives. While the company was known to exploit the Tlingit people, the church was outwardly opposed to this, leading them to secretly help the natives. Innokentii died in 1879, well after the end of the Russian-American Company although his contributions to the religion of the native people did not go in vain. It is said that there are 40-90 Orthodox churches with some 20,000 or 50,000 members in Alaska today. 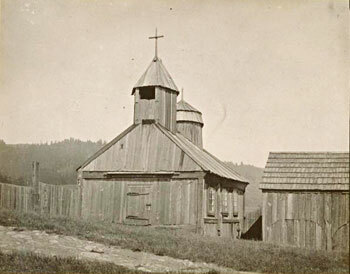 The Orthodox Church was undoubtbly an important aspect of the company, especially in it’s ventures in California where the clashing cultures and traditions of the Native Californians, Russians, and Native Alaskans were able to cooperate due in part to the values of Christianity, which most of them followed. But it would seem religion was not so successful in bring together people in Alaska. Despite the assistance offered by the church, the remaining native population during the mid 1850’s, primarily the Aleuts and Tlingits (who became more of a force after becoming the RAC’s main supplier of food products) held contempt for the company’s actions and later began to wage war on the Russian traders, despite attempts by the RAC and the Orthodox church to establish schools, employment and hospitals for them. This time brought much change, primarily the economic value of otter pelts, which continued to drop. 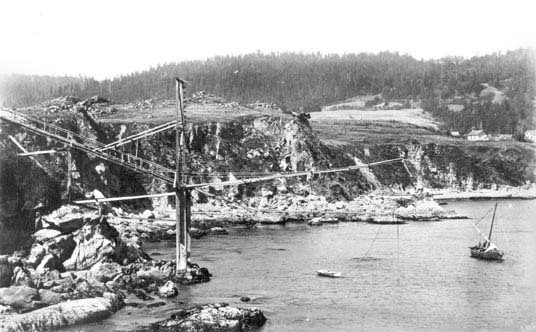 As such, the company began searching for possible ways to generate more profits from the land, much of the area’s wildlife and minerals were examined finding a substantial population of whales and trace amounts of gold and coal. For a brief moment, the company pursued these opportunities, but they failed to provide any substantial use to the company’s traders, due in part to their unfamiliarity with the land and the fact many of these materials were readily available elsewhere at a lower cost. Interestingly enough, the large deposits of gold the company had once searched for would later be found in 1897, beginning the Klondike gold rush. By the 1860’s the fur trade began to decline further, which is when Alexander II held a meeting on the future of Russian America. It was decided, at this point, that Alaska had become more of an inconvenience to the nation rather than what it was originally predicted to be. Choosing to focus more on prospects in Asia such as the Amur Basin in China, the tsar sold Alaska to the United States for 7 million dollars or 14 million rubles (about two cents an acre), this was known as the Alaska purchase, which took place in Sitka on October 1867 and was signed by American Secretary of State William H. Seward and Russian envoy Eduard de Stoeckl, one account of the event mentions the lowering of the Russian flag to be replaced with an American one, symbolizing a new future for Alaska. 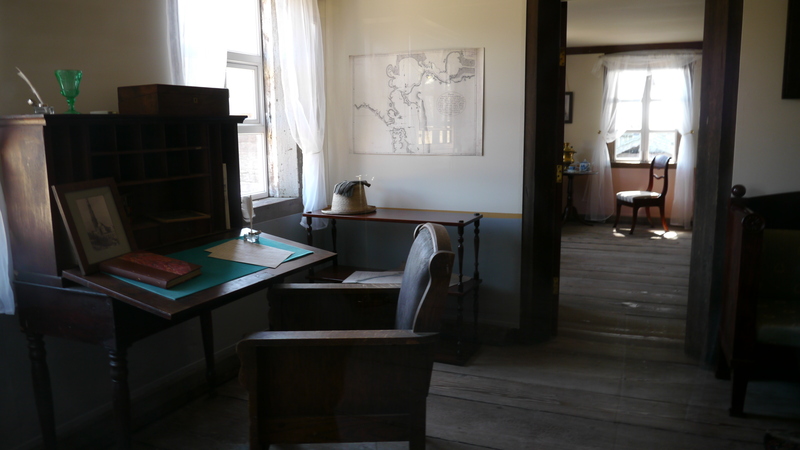 This entry was posted in History, Museum, Russian America, Russian Exploration. Bookmark the permalink. You can also find out more about the book at my website: http://www.ericjaydolin.com. Please share the links to my video and website with others who might be interested in the book. 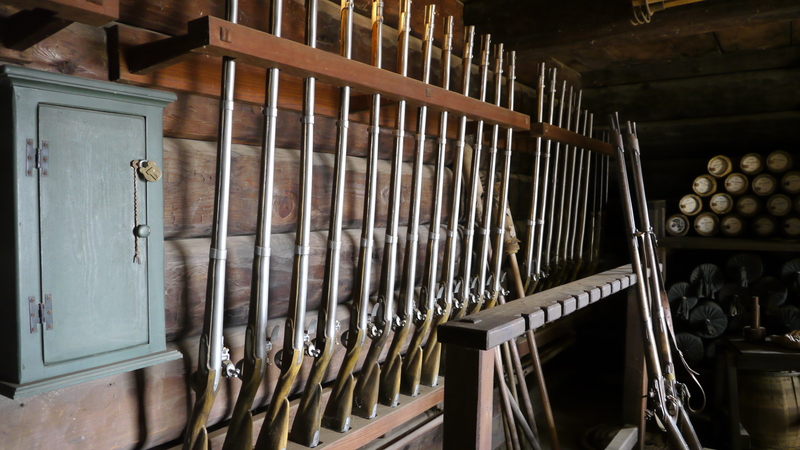 On page 5 of this blog, the author refers to a number of revolts across the islands and that the Russians retaliated with violence destroying much of the Aleuts’ boats and hunting tools. 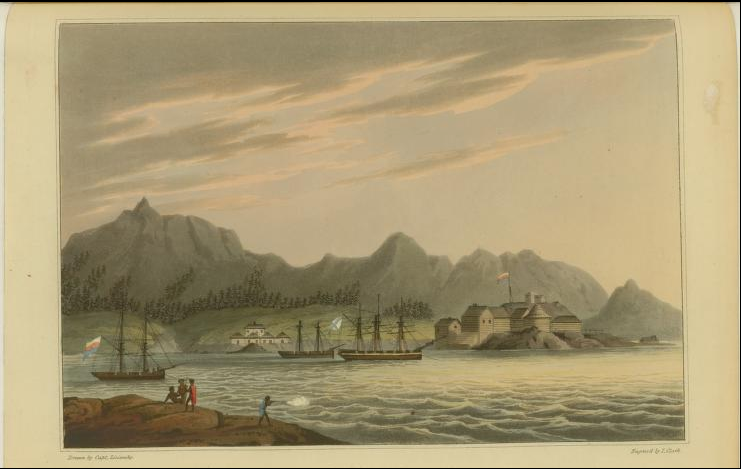 In 1763-1764 the Aleuts revolted resulting in a repression by the Russians that lasted for twenty years. I would appreciate any information the author would like to share on his comments on page 5. Interesting article. The overview is good, although there are various mistakes in the details. St. Michael is at the mouth of the Yukon River, far, far from Sitka, etc. Bering did not die of scurvy; they don’t know what ailment, but his teeth were firmly in his skull in 1992, when the archeology dig at Bering Island was made. Proof the Russian American Company document for the use of the word “its”. If you place an apostrophe – it’s – you are meaning “it is”. “It’s” is a contraction of “it is”. “Its” is possessive, same as his, hers, theirs. You don’t write hi’s, her’s, or their’s. Thanks for this highly educational blog. The relation of German Physician George Anton Schaeffer’s (1779-1836) efforts to take over Kaua’i and indeed the rest of the Hawai’ian islands during the consolidated reign of Kamehameha I in 1815-1817 is essentially accurate here. Now more detail on this is available in my (Lee B Croft’s) recently published biographical trilogy on George Anton Schaeffer, especially in the second book of the trilogy–GEORGE ANTON SCHAEFFER: Arm Wrestling Kamehameha. See these at http://www.lulu.com/LeeCroft. Some of George Anton Schaeffer’s correspondence with Russian-American Company Manager Alexander Baranov (whose son Antipatr accompanied Schaeffer to Hawaii) is included, some of it previously unpublished, and also the life and historical role of Kaua’i’s last King Kaumuali’i is given in previously unmatched detail.